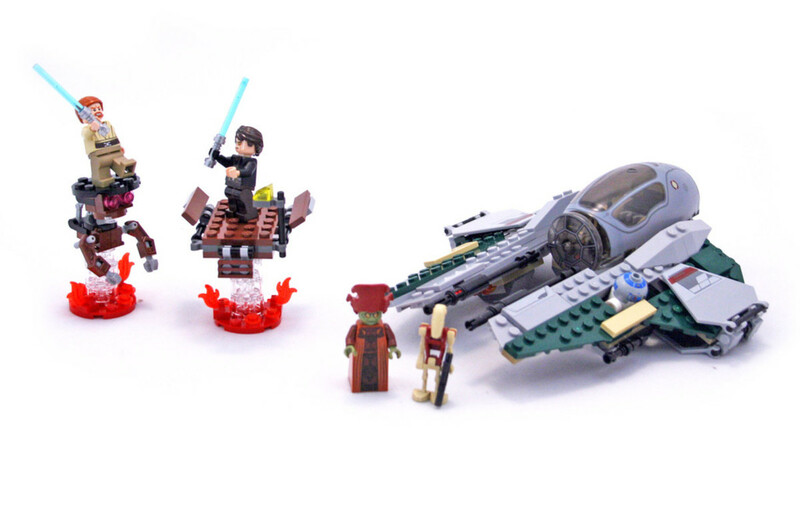 In 2012, LEGO Star Wars was still going strong and they continued to add new ideas to the theme. 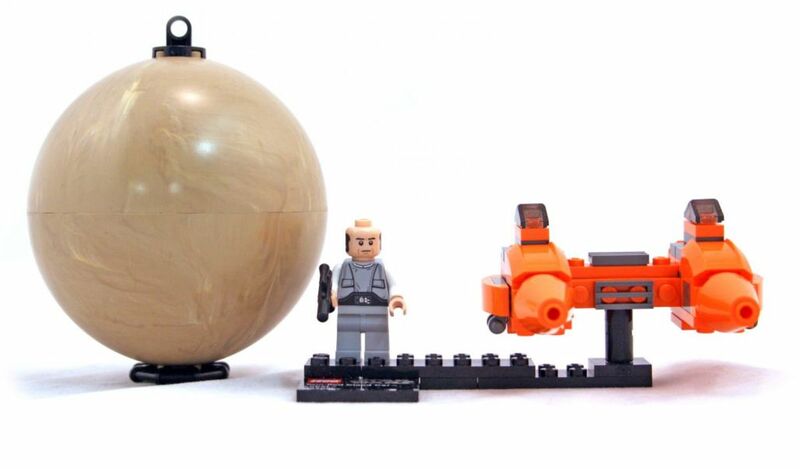 This year would see miniature models of the planets and moons found in a galaxy far, far away. 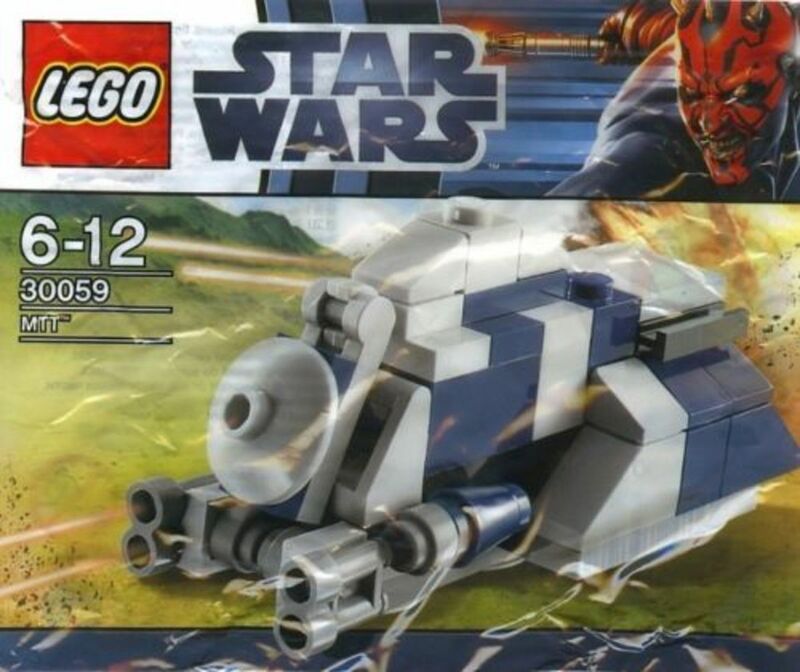 Eta-2 Actis-class light interceptor was used by the Jedi late in the Clone Wars. 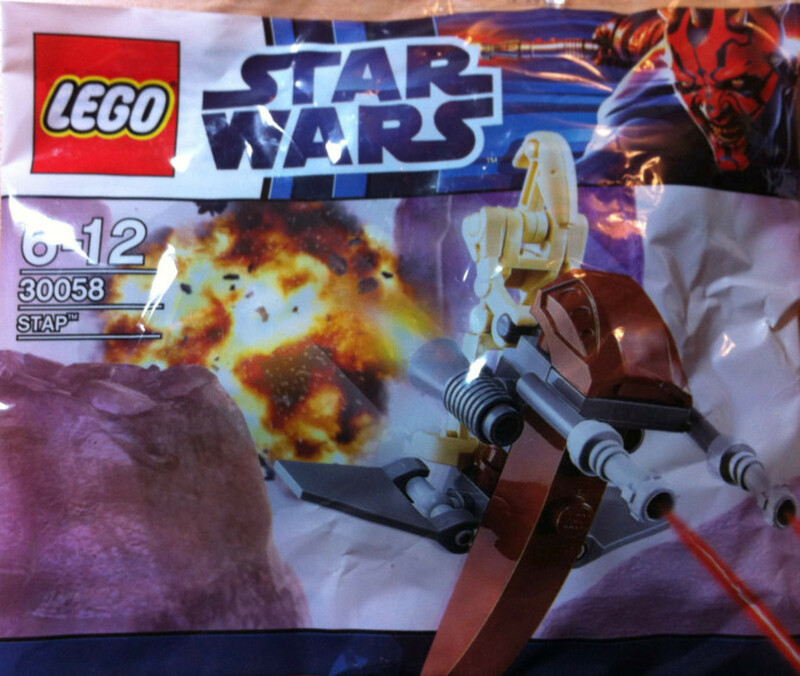 Technically, this is not Anakin's interceptor. He stole this ship from the Jedi Temple to get to Mustafar and assassinate the Separatist leaders. 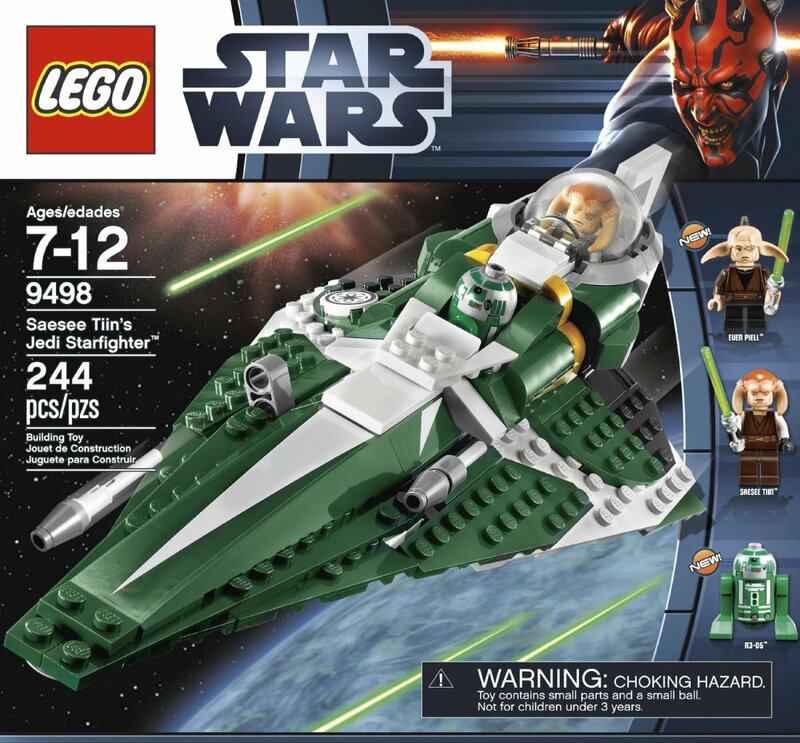 The dark green interceptor has the standard opening cockpit to seat one minifigure and folding wing flaps. 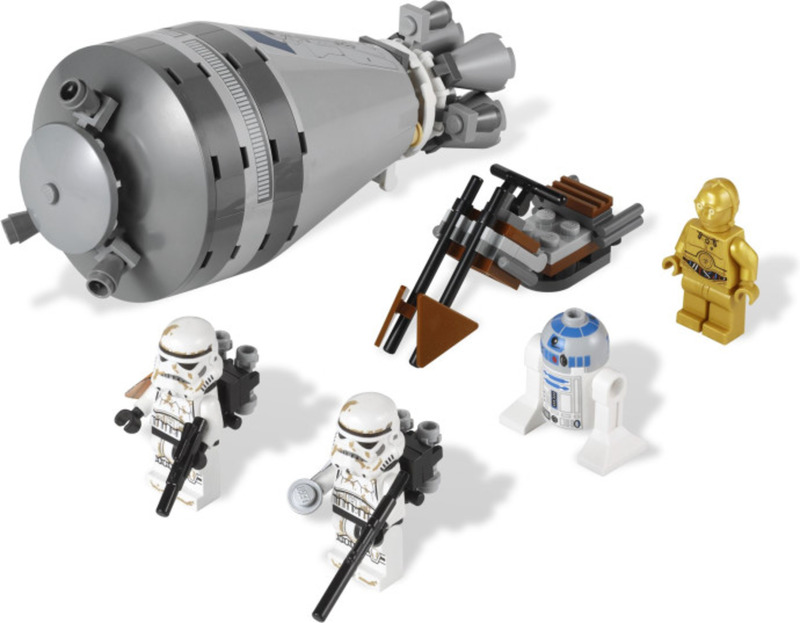 This would be the first ETA-2 interceptor that could accommodate the entire Astromech droid minifigure, instead of just the dome, and to be armed with flick-fire missiles. In order for Anakin and Obi-Wan to have their epic battle on molten lava, a small mining platform was included in the set. 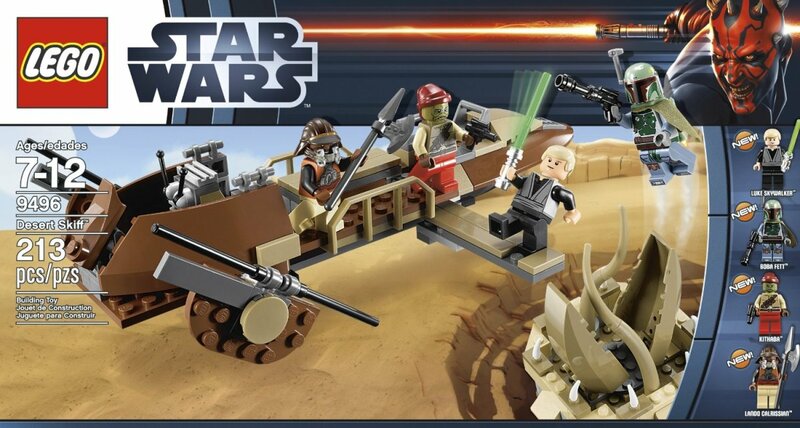 This set is based on the scene from Return of the Jedi when Han, Chewbacca and Luke are about to be fed to the Sarlacc. 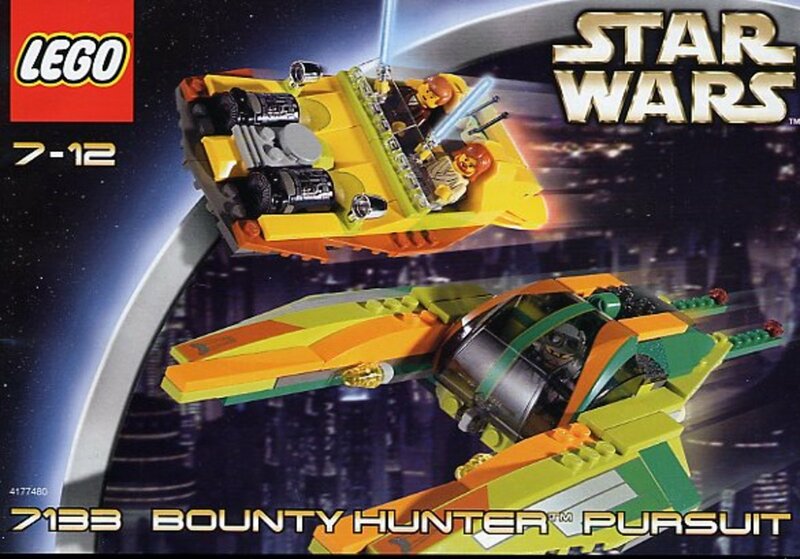 The Bantha-II cargo skiff is the main model in this building set. The skiff measures 9" long and is filled with interactive features. It is armed with a flick-fire missile. The cockpit has control levers for the minifigures to operate. A plank can be extended to replicate Luke's acrobatic skills or feed the Sarlac. Since not everyone can store their weapon in R2-D2, there is a weapons locker on board. 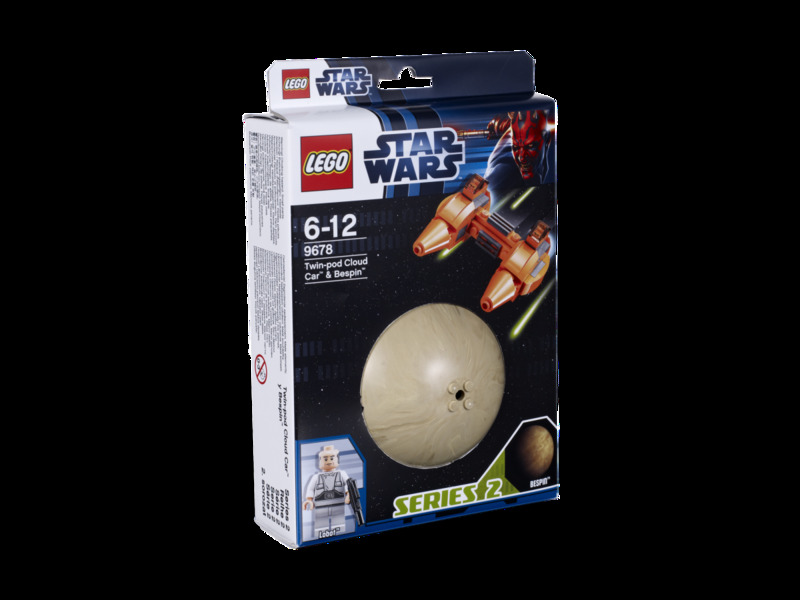 At about 3" wide and 3" long, this was the first Sarlacc capable of fitting an entire minifigure in its opening and closing mouth. The tentacles can be moved into different positions. 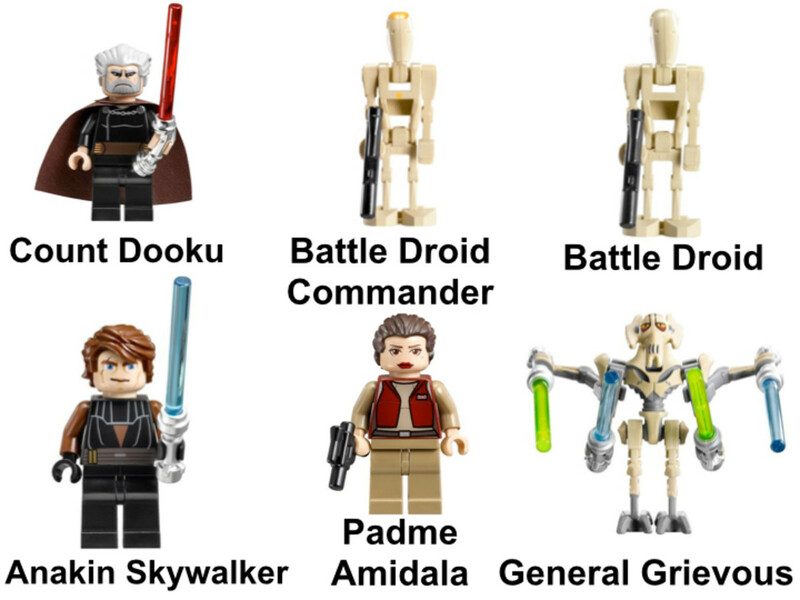 All the minifigures is this set feature new designs. 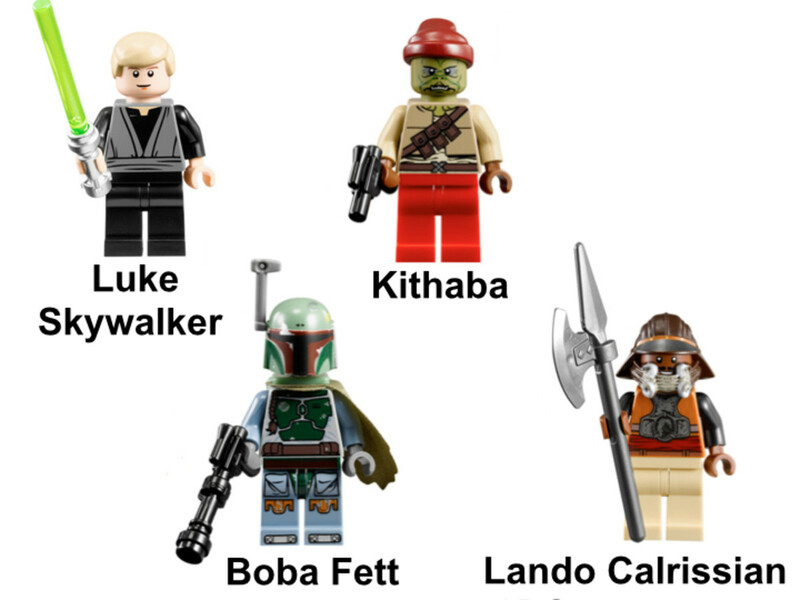 The Kirhaba minifigure made its very first appearance. 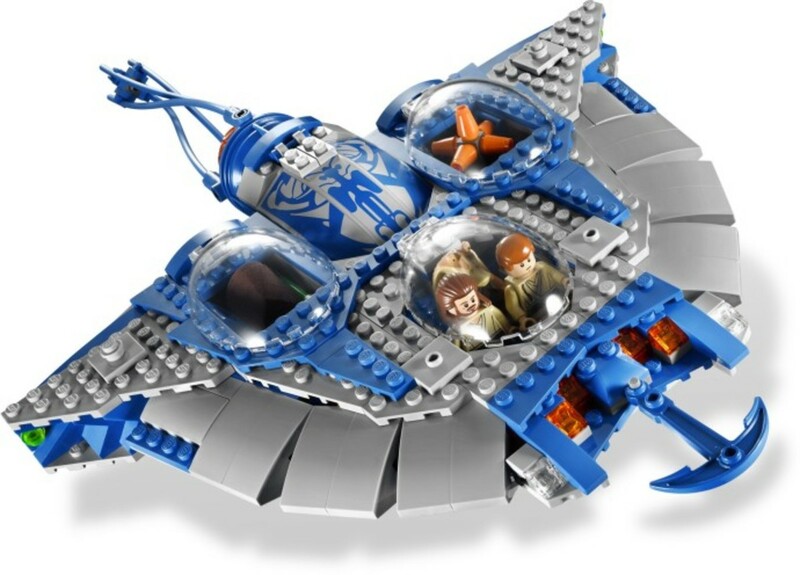 This escape pod building set features a lot more detail than the original 7106 design released back on 2001. 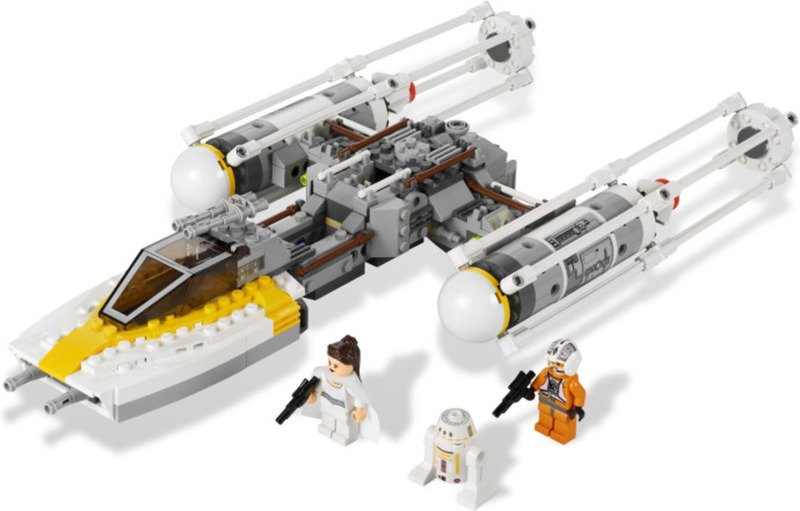 The escape pod's cover can be removed to reveal the interior of the craft and seats for minifigures to use. 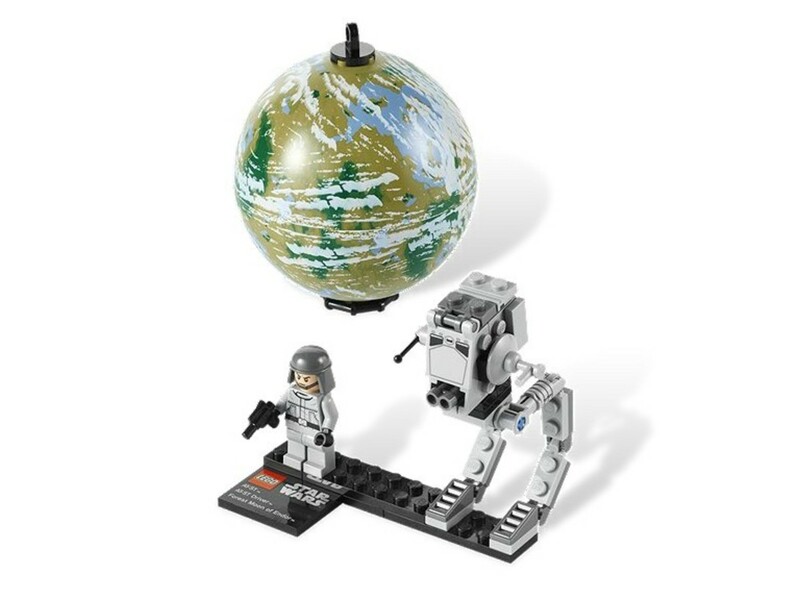 The set comes with droid wreckage for the Empire to find. Rather than dewbacks, the Sandtroopers are given a small speeder bike. 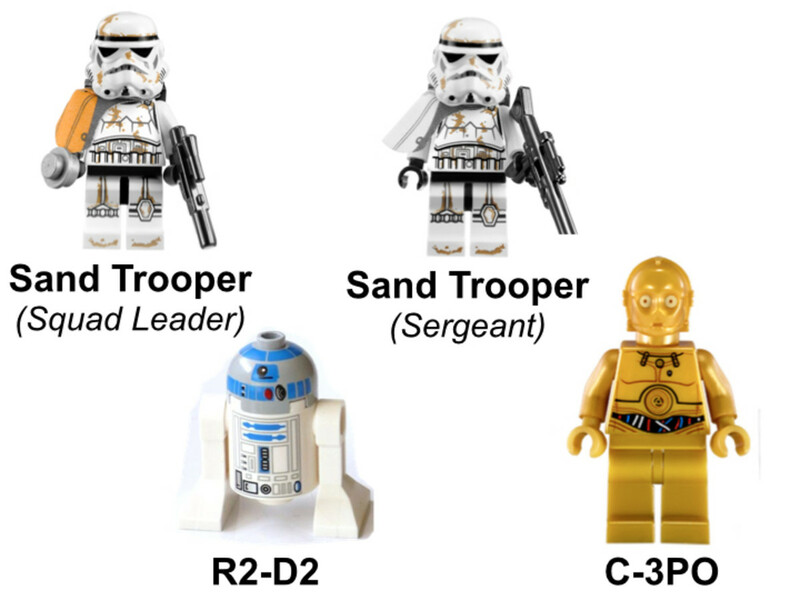 The Sandtroopers' pauldrons are different colors to depict their individual rank. The one with the white pauldron is a sergeant and the orange is the squad leader. Both troopers printing has has been colored to show how dirty working in the desert can be. 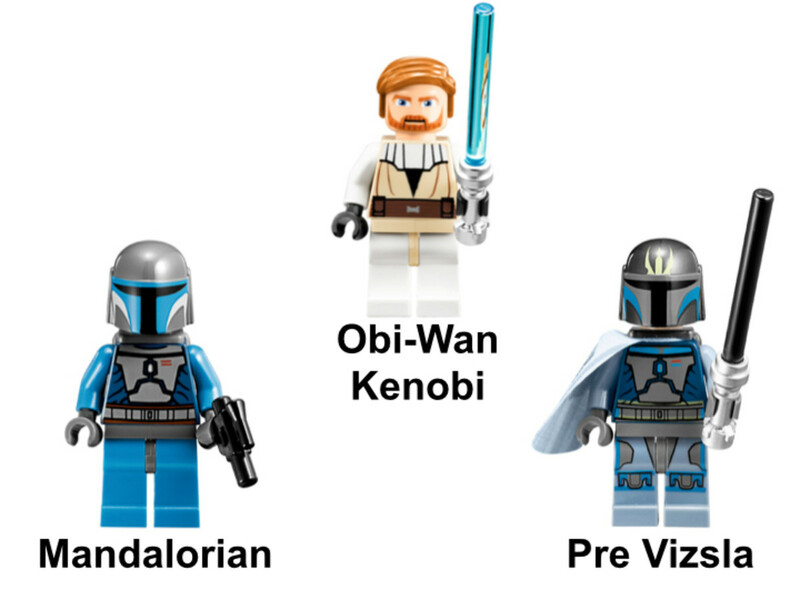 The printing on their faces is similar to Jango Fett. 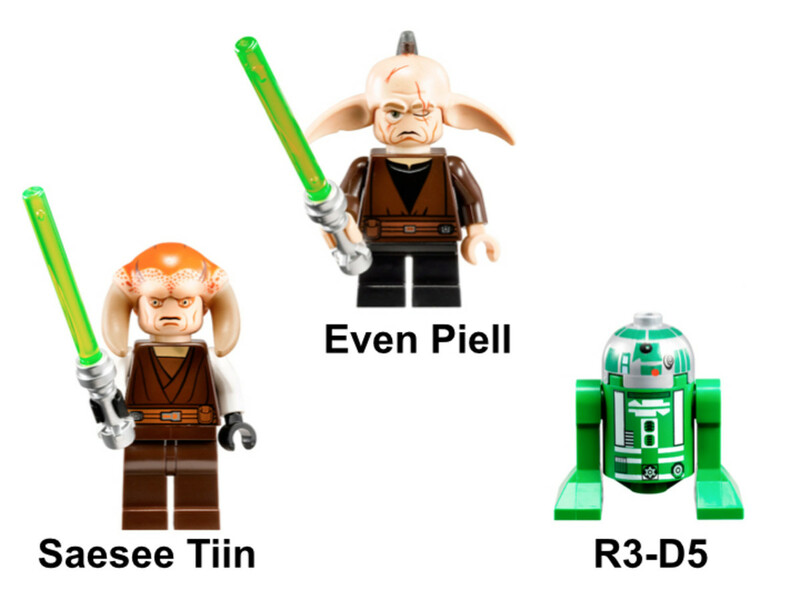 This would be the first C-3PO minifigure released with a printed headpiece. The main model is the Republic AV-7 Anti-Vehicle Cannon. 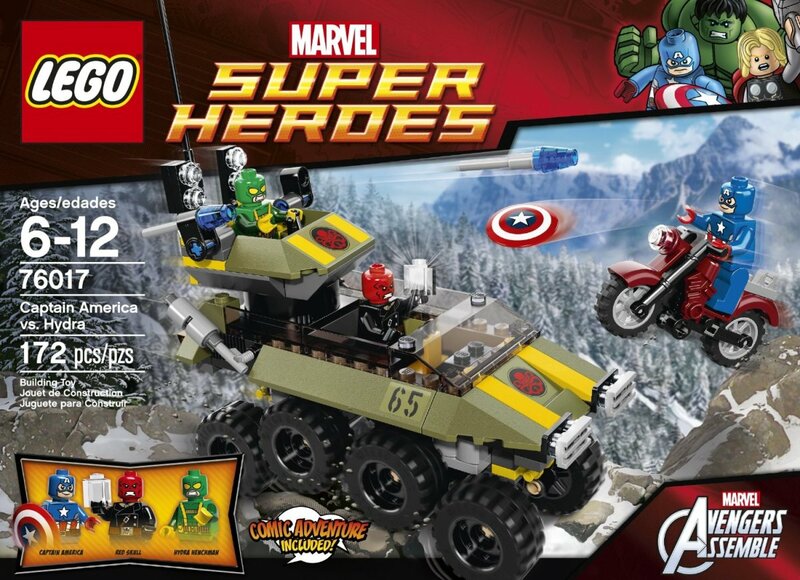 However, as a battle pack, the vehicle is not the focus. 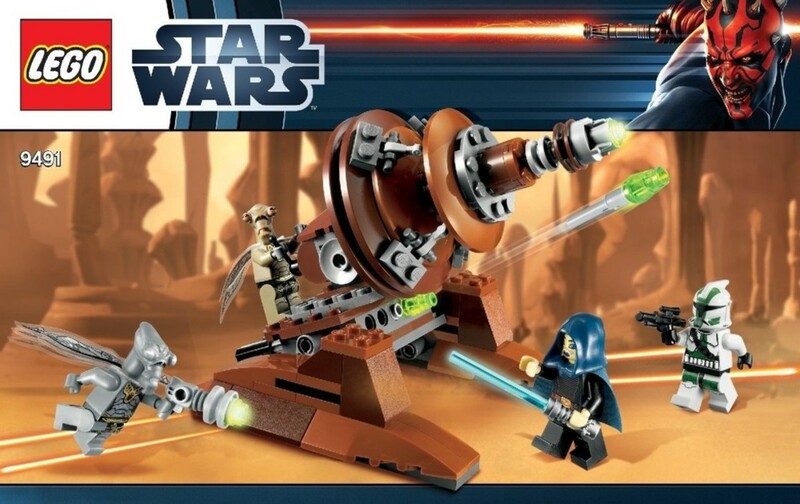 The Republic Cannon is much smaller in scale than the actual weapon seen in the show. 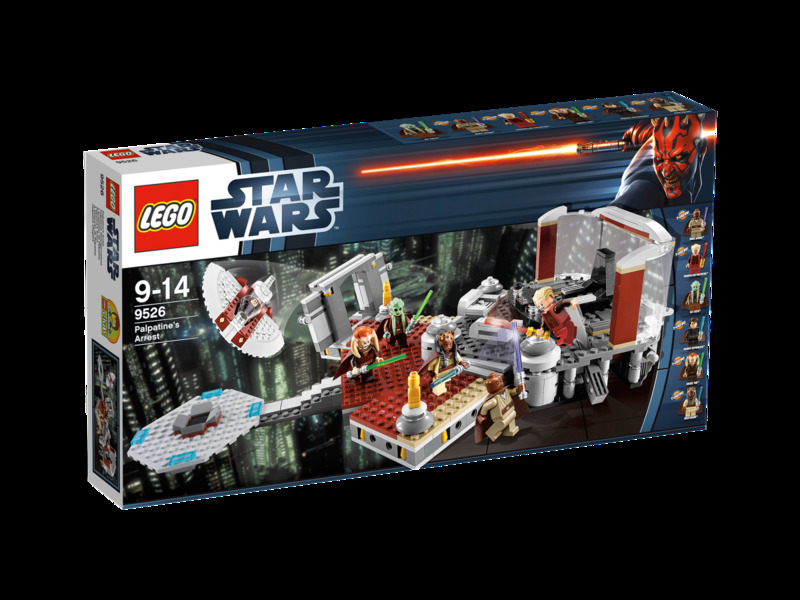 It has room to seat one minifigure and packed with interactive features. It has adjustable handlebars, poseable legs, moving gun barrel and flick-fire missiles. This would be one of the first battle packs to have opposing sides in the same box, so you can instantly create battle scenes. 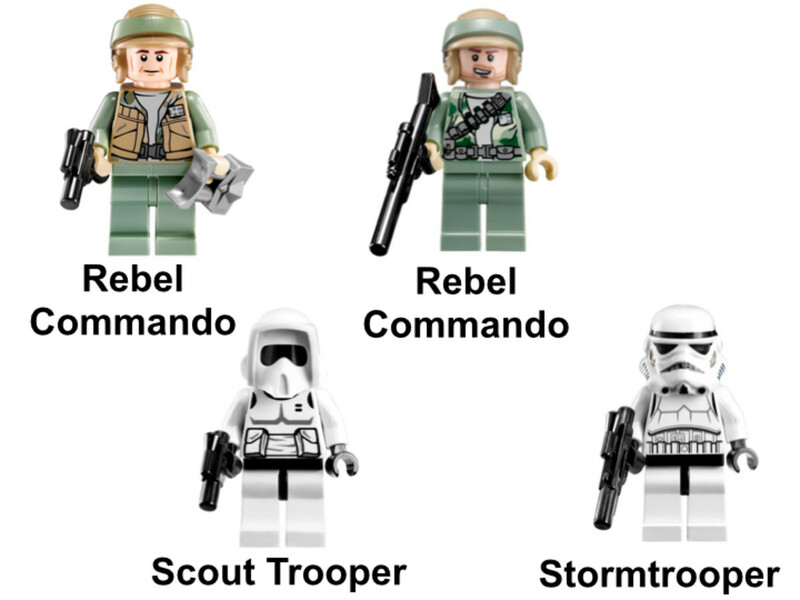 The Commando Droid and ARC Trooper minifigures made their first appearance in this set. 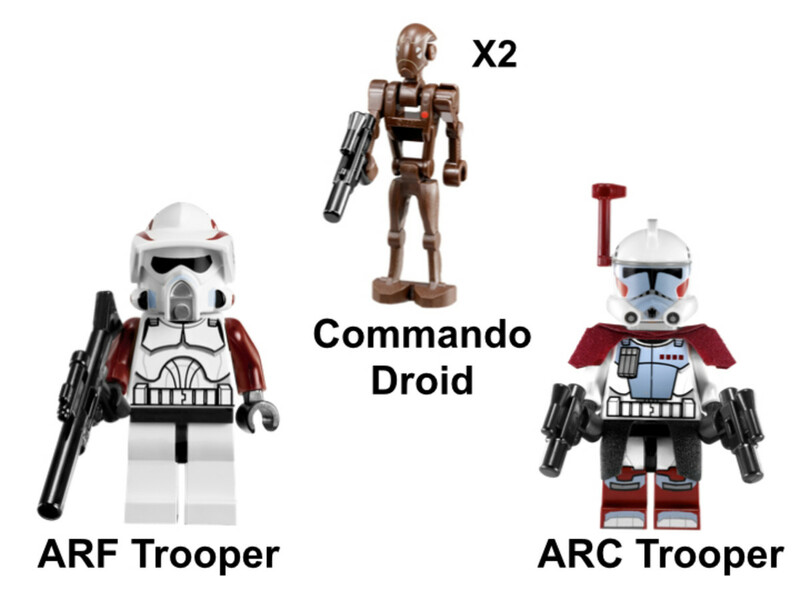 The ARF Trooper Minifigure was redesigned to look like the troopers seen on Kamio in the third season of Star Wars: The Clone Wars animated television series. The BTL Y-Wing Fighter was the workhorse of the Rebel Aliance. Its ability to carry a large payload and take a beating made it ideal for use as a bomber. 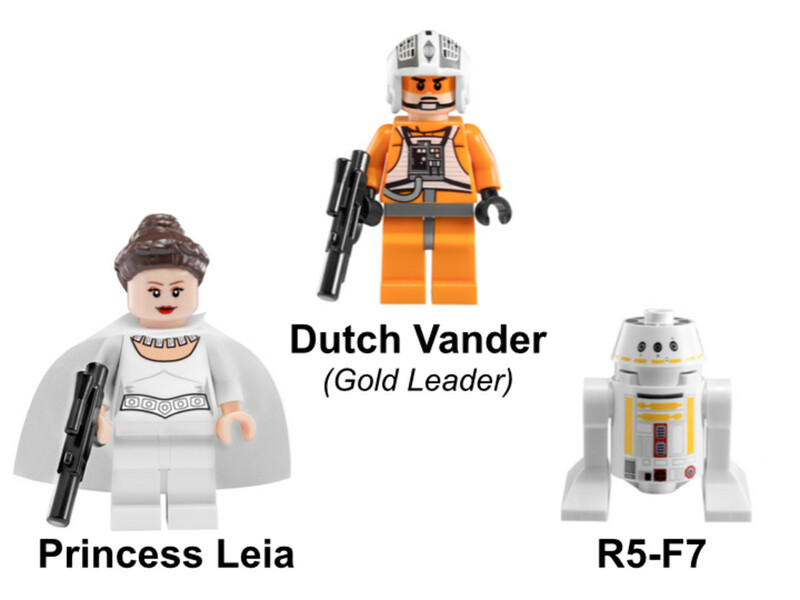 Gold Leader was Dutch Vander's call sign during the attack run on the first Death Star. LEGO put a lot of detail in the creation of this model. The cockpit canopy opens, allowing Dutch to pilot the ship. Its top cannon rotates and is armed with two flick-fire missiles on its wings. To recreate its use as a bomber, the fighter can be loaded with bombs and then dropped from below. 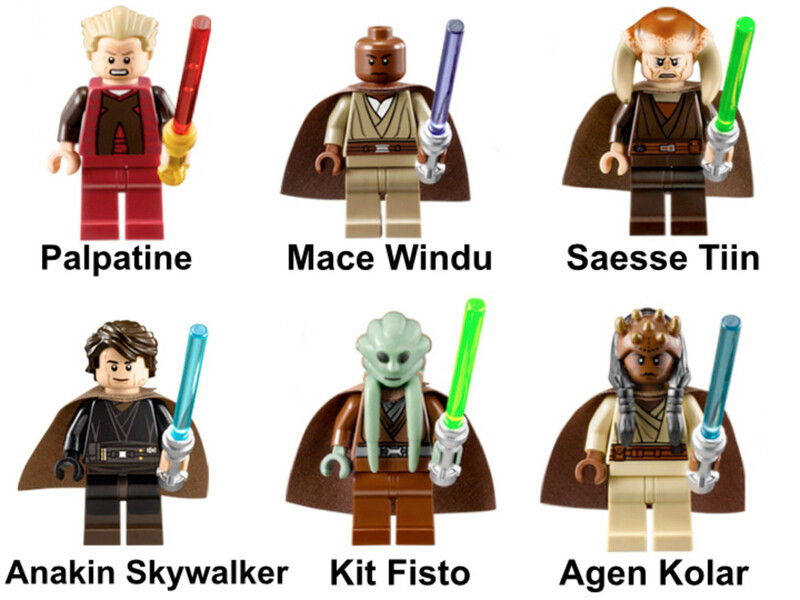 Several inaccuracies were made with the minifigures in this set. The Astromech droid was referred to as Wedge Antilles' R2-A3 droid, instead of the correct R5-F7. Princess Leia was put in her ceremonial outfit, but Dutch was killed during the battle and could not have received a medal. This building set was based on the Battle of Endor in Return of the Jedi. 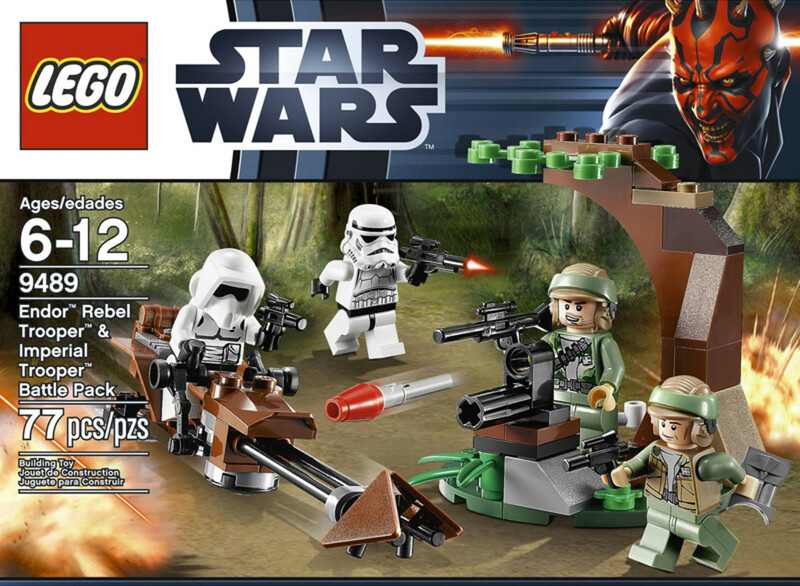 It is also one of the first battle packs to include both sides of the conflict. 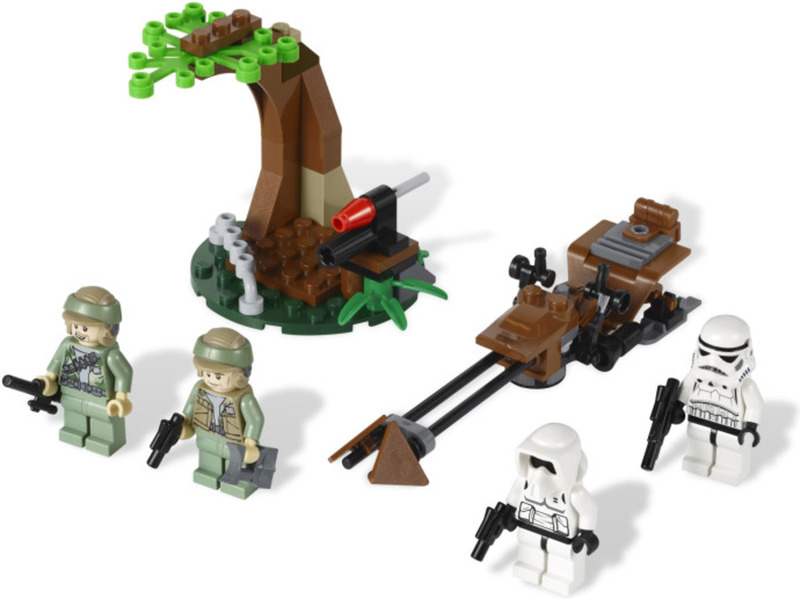 The Rebel Commandos have a hideout under a tree to ambush the Imperial forces. 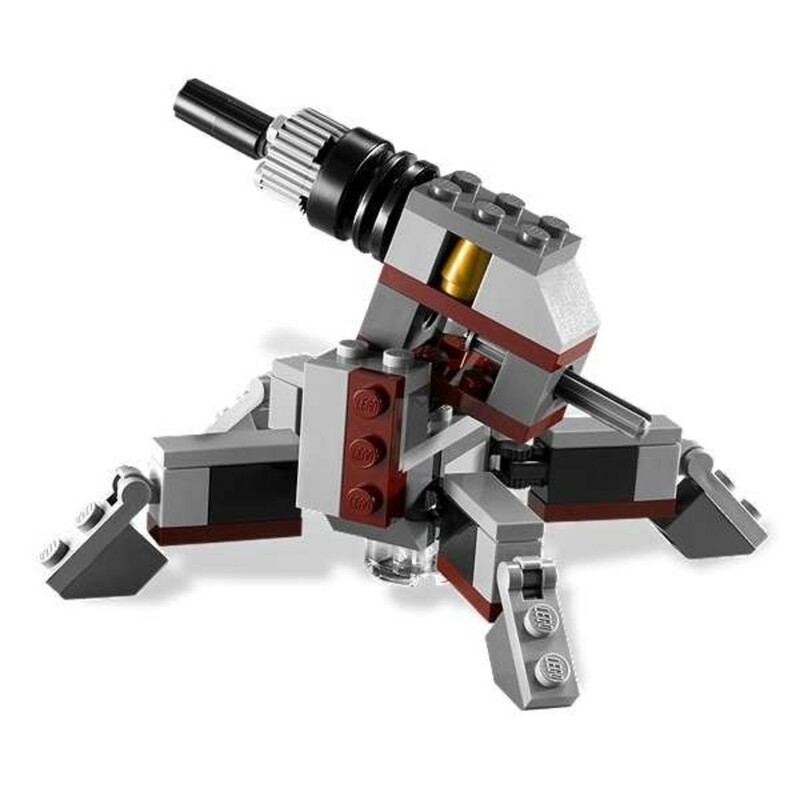 It has a turret armed with a flick-fire missile and a weapons rack. 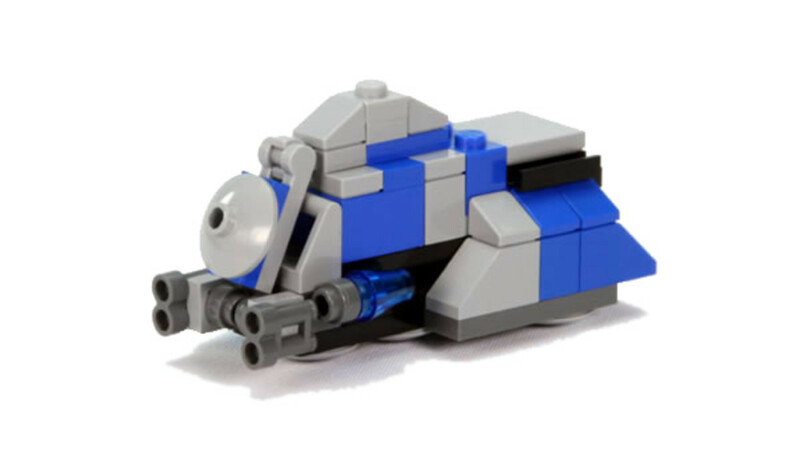 To hunt the Rebels down, the Empire's side has a small speeder bike measuring a little over 5" long. 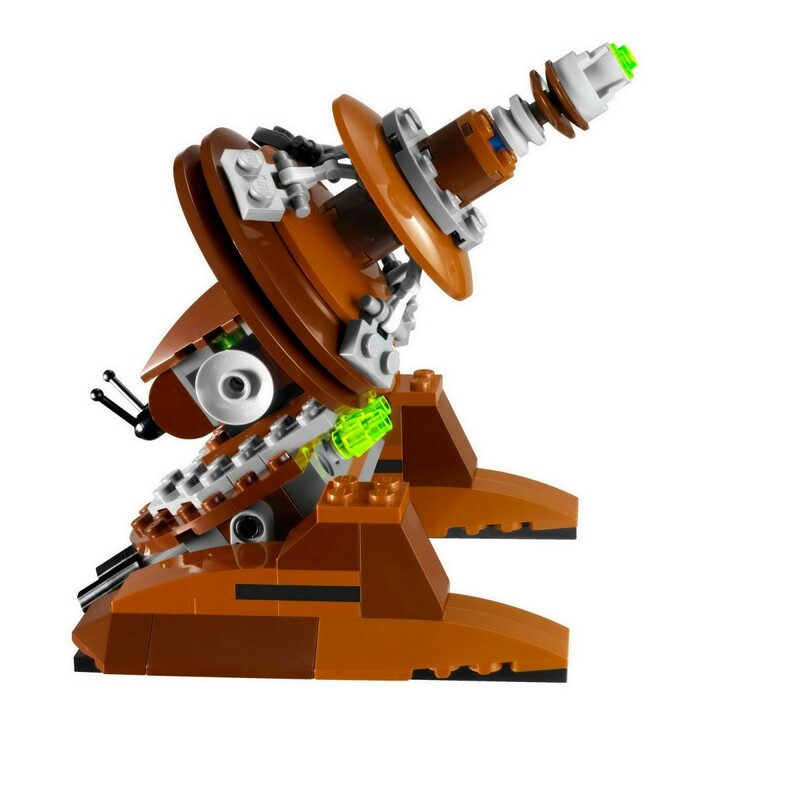 This is the second LR1K Sonic Cannon released by LEGO. 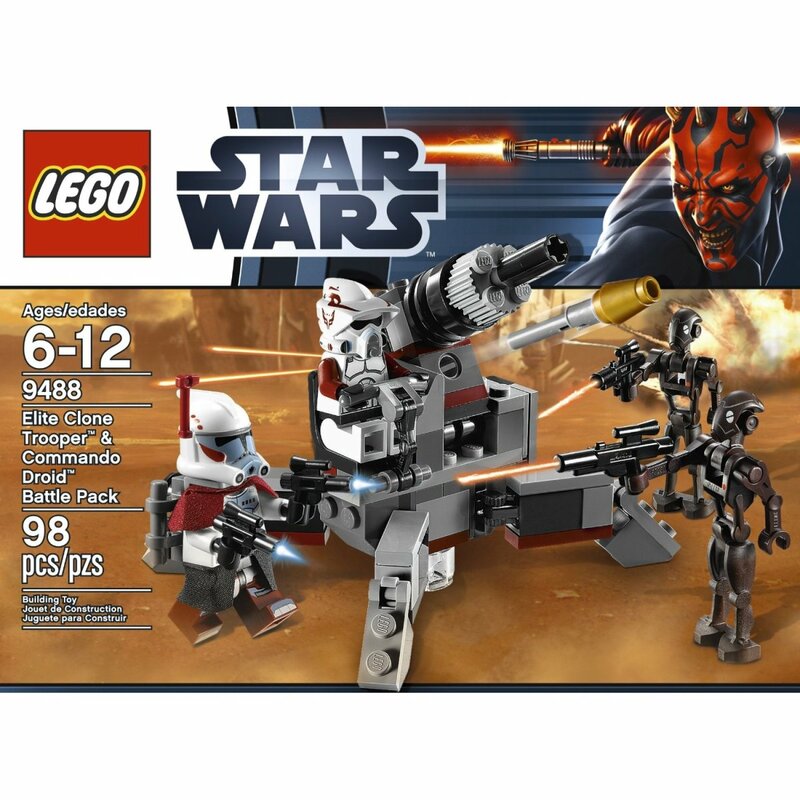 The Geonosian Cannon were mass produced after Poggle the Lesser joined the Sepratist. It first saw action in the Battle of Geonosis during Star Wars Episode II. 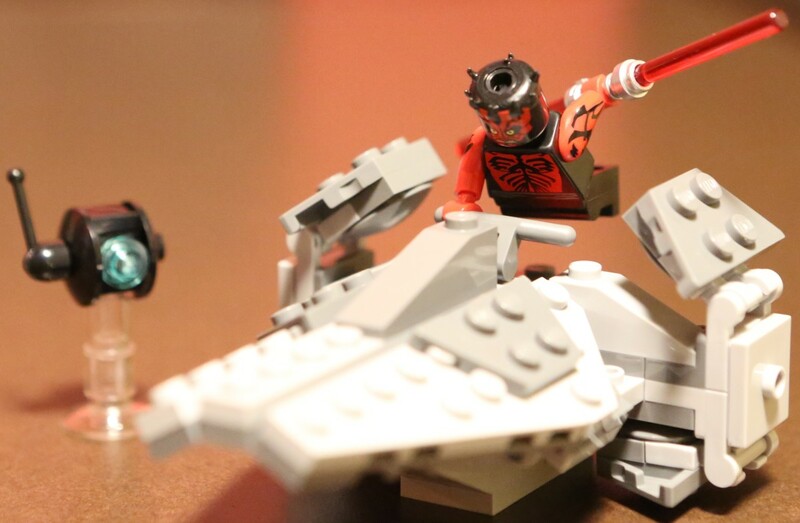 One minifigure operates the weapon from the rear. The main cannon can be tilted up or down and two flick-fire missiles are underneath, at the base. The model measures over 6" long and 3" wide. 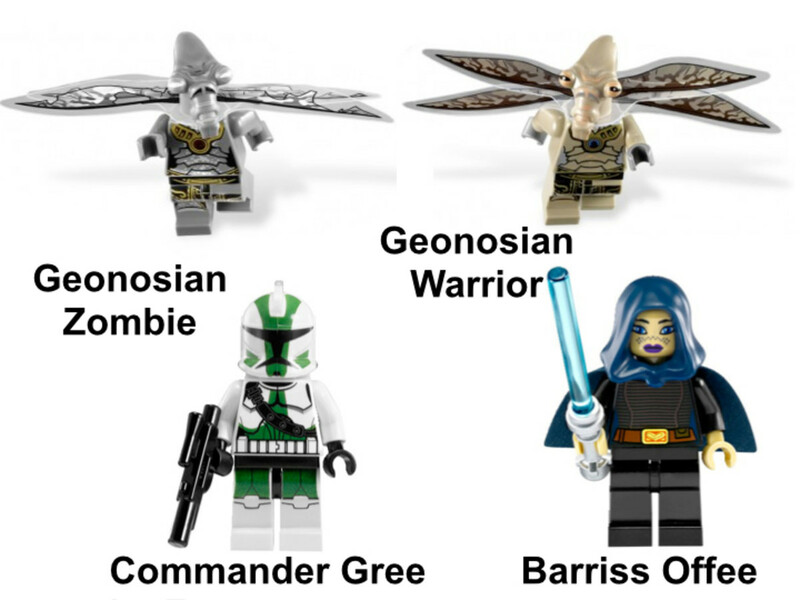 While all the minifigure are redesigned for this set, the characters Commander Gree and the Geonosian Zombie make their debut. Tribubble Bongos were built around a coral skeleton and made to resemble the creatures found in the depths of Naboo's waters. Each craft had a unique look. This model is the one used by Qui-Gon, Obi-Wan and Jar Jar to travel throght the planets core to reach Theed Palace and rescue Queen Amidala. 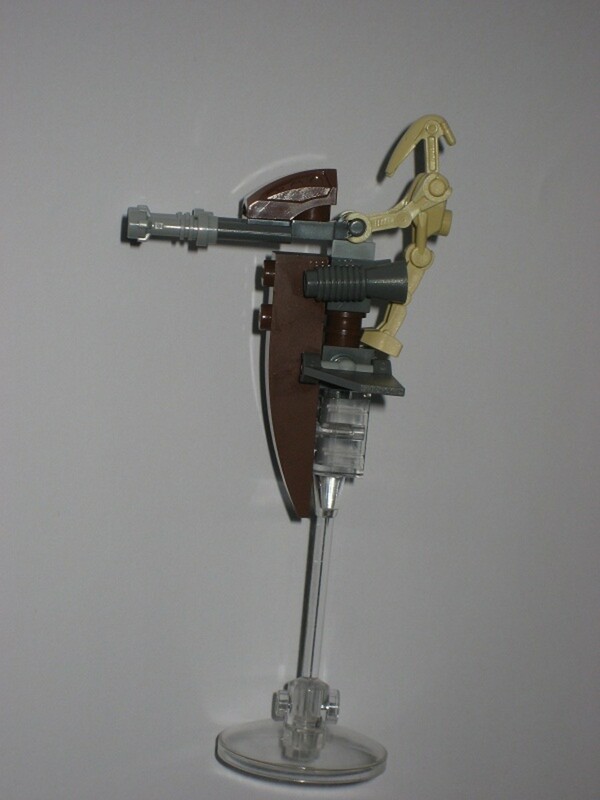 The Gungan Sub has three cockpits, but all three minifigure fit into the front section. The other cockpits are used for storing cargo and equipment. The rear tail propeller actually rotates and the sub is armed with four flick-fire missiles. A mini-sub can detach from the main vehicle and is armed with a harpoon. 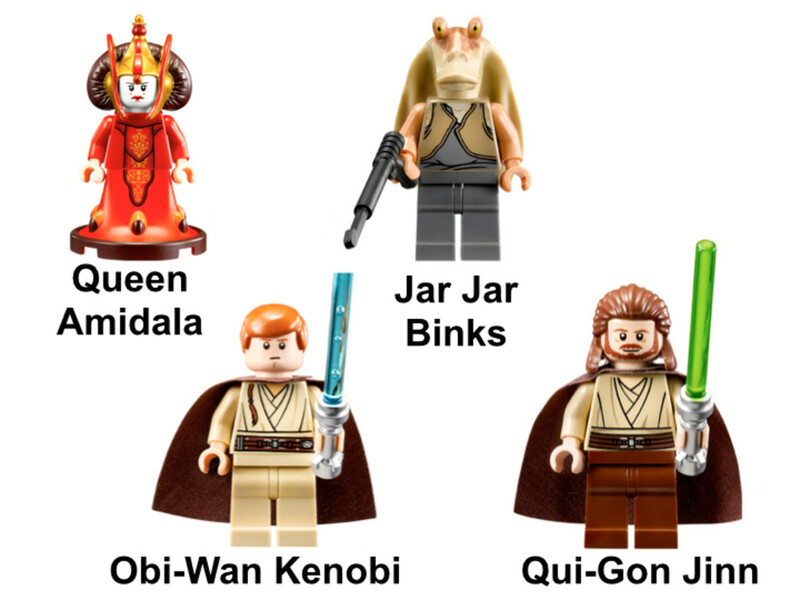 Qui-Gon Jinn and Obi-Wan Kenobi have been redesigned with two sided heads. One side has the aquata breathers used to let them swim underwater in episode 1. 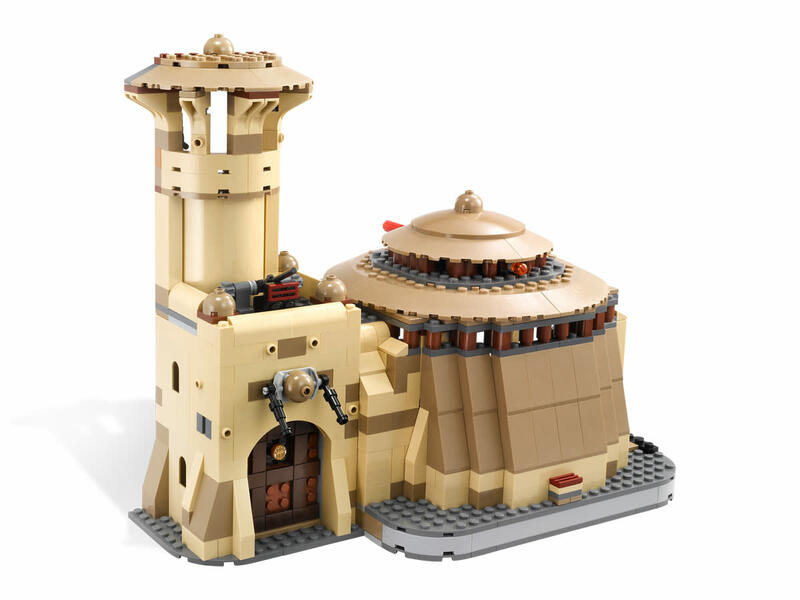 Jabba's Palace is represented by the main dome and tower. The tower is three stories high and mostly used to store weapons and supplies. It has a small entrance on the ground level. The roof of the main building has a flick-fire missile. The top can be removed to more easily access the inside. For added security, the gate has a movable gun. Han Solo's carbonate prison is located next to Jabba's movable throne. Moving the throne reveals the trap door. 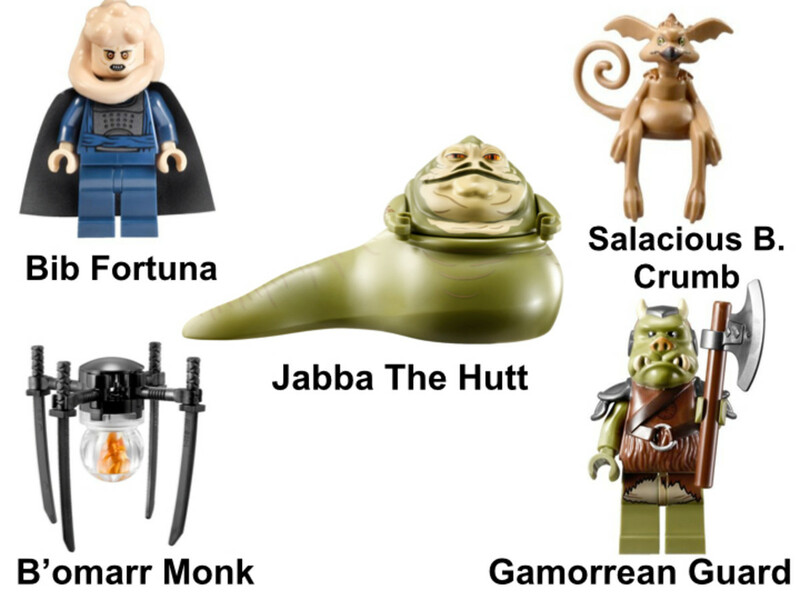 Jabba the Hutt was redesigned. 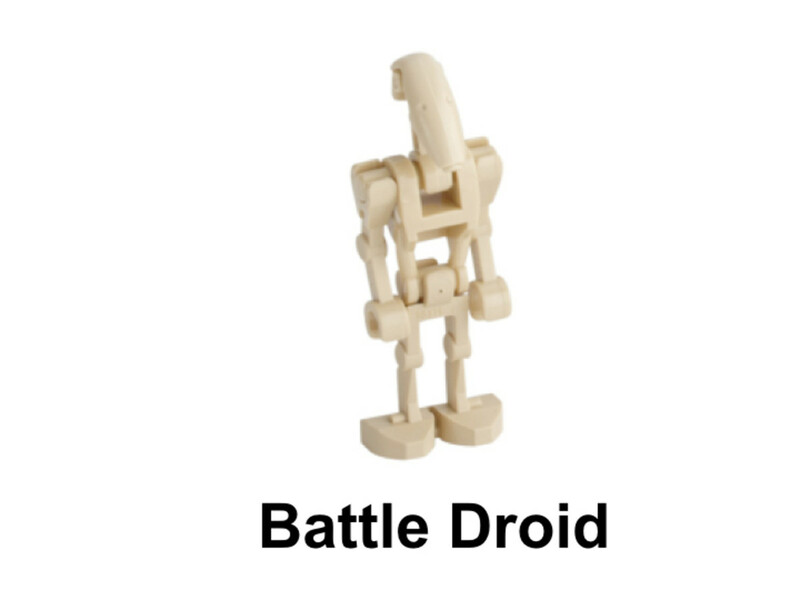 His Minifigure can now move its head, arms and body. To help with the building and taking down of the model, LEGO included a brick separator. 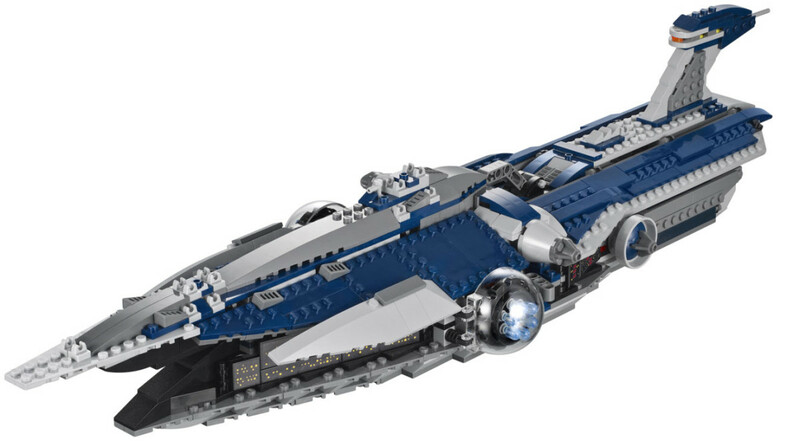 The Malevolence was the personal flagship of General Grievous. This Subjugator-Class Heavy Cruiser was longer than four Venator-Class Star Destroyers combined. 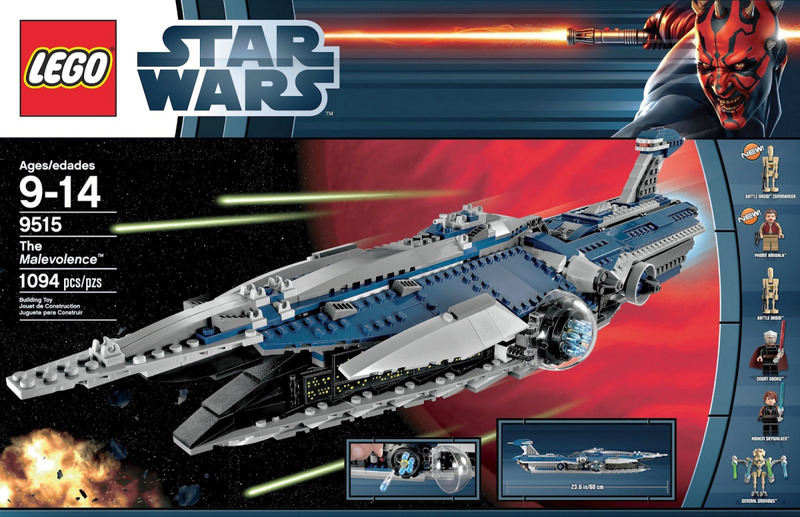 Malevolence was seen in the opening battle sequence of Episode II and heavily featured in the animated series. 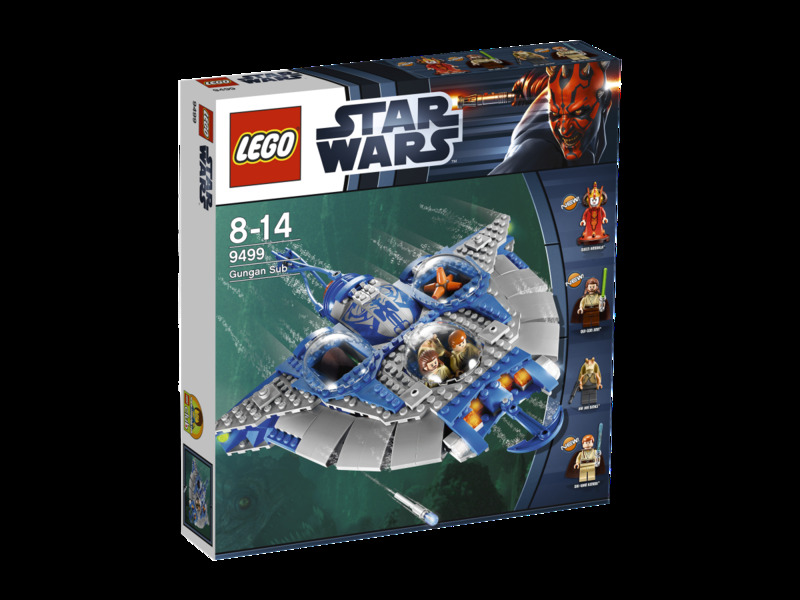 This set is based on the fourth episode of The Clone Wars, titled Destroy Malevolence. The model measures over 26" long, 7" wide and 5" tall. A handle on top helps builders lift the ship off the ground. Twin quick flick-fire missiles are located behind the domed ion cannons on the side of the ship. The detailed interior can be seen by removing the front section or flipping open the rear roof. 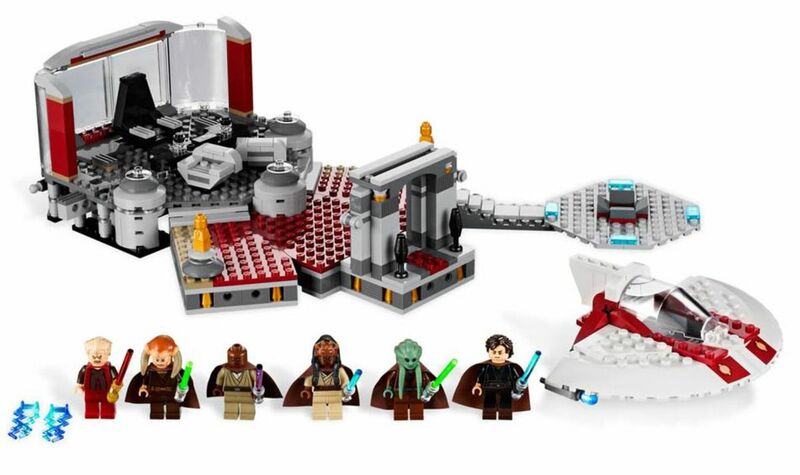 This set recreates the scene in Episode III where the Jedi have discovered Palpatine is actually Darth Sidious and go to arrest him. The Jedi are defeated and Anakin is officially dubbed Darth Vader. The main part of this model is Palpatine's office. The door to the room slides open and has enough room for one minifigure to use at a time. A gold minifigure statue is to the right of the entrance. The only other notable set pieces are Palpatine's desk and office chairs. To aid in the dynamic play, there is a lever to let a minifigure perform a force jump and a catapult to throw someone out the window. The building also has a detachable landing platform and walkway to the office. 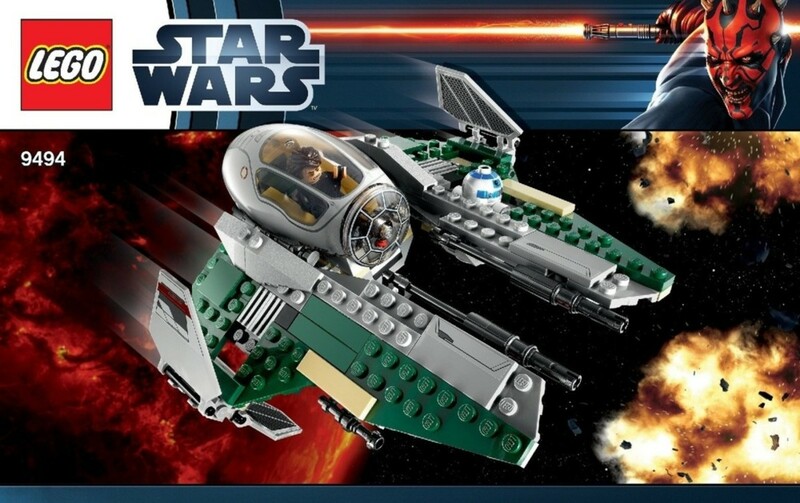 There is a simple Jedi airspeeder with an opening cockpit and dual flick-fire missiles. Pre Vizsla's personal Kom'rk-Class Fighter/Transport was called the Gauntlet. It was primarily docked at the Mandalorian's secret base on the moon Concordia. Until the base was discovered by Obi-Wan and they were forced to evacuate. At over 12" long, 12" wide and 2" high, this model showcases the might of Mandalorian army. The cockpit has enough room to fit two minifigures. The wings rotate around the center of the ship to switch from flight or landing mode. The retractable landing gear is located under the cockpit. The center of the ship can be lifted up to reveal a cargo hold. The two front cannons are able to be move side to side, as they track their target. The rear cannons were made to spin on a circular piece, but there is a design flaw. There is not enough space for the cone to slide into the blaster nozzle and snap into place. The Talon-Class Republic Starfighters was used by the Old Republic extensively before and during the Great Galactic War. While most were destroyed by the Sith during the campaign, a few survived and fought during the Battle of Alderaan. The opening cockpit is closer to the back of the ship than the front. Each wing is armed with one laser cannon and two flick-fire missile. The wings can be pushed forward and in toward the nose of the ship. 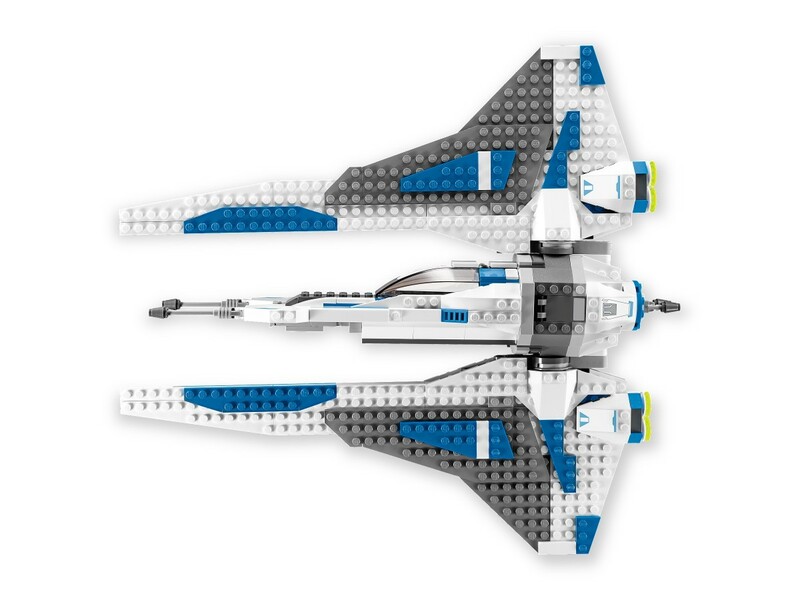 This gives the fighter a similar appearance to both the X-Wing and A-Wing fighters used by the Rebel Alliance in the future. The two clips in the back are for storing Satele Shan's lightsaber. 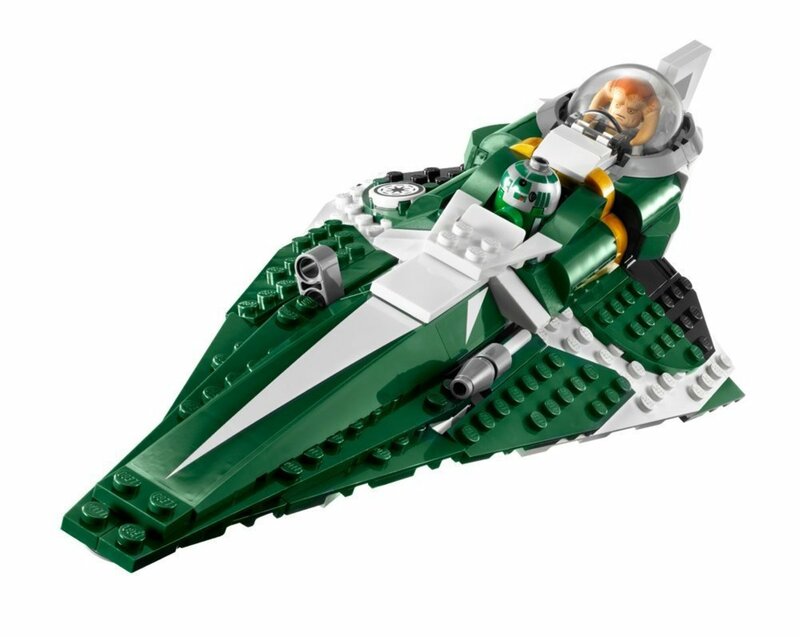 Saesee Tiin flew a green Delta-7B Jedi Starfighters. 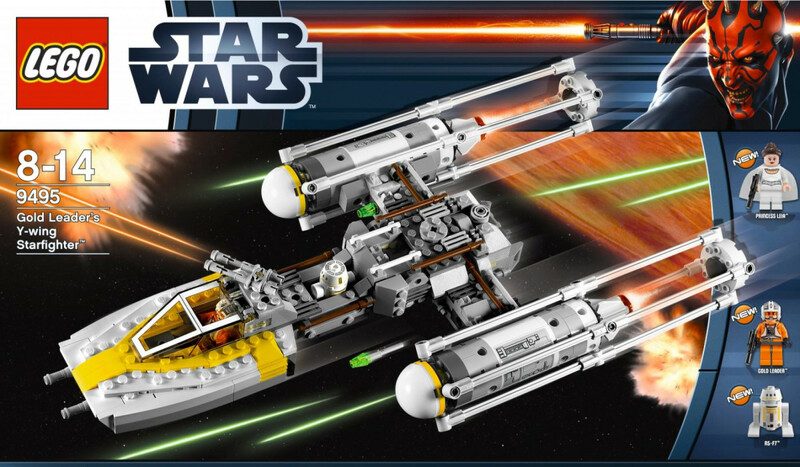 His Jedi Starfighter is armed with four flick-fire missiles. 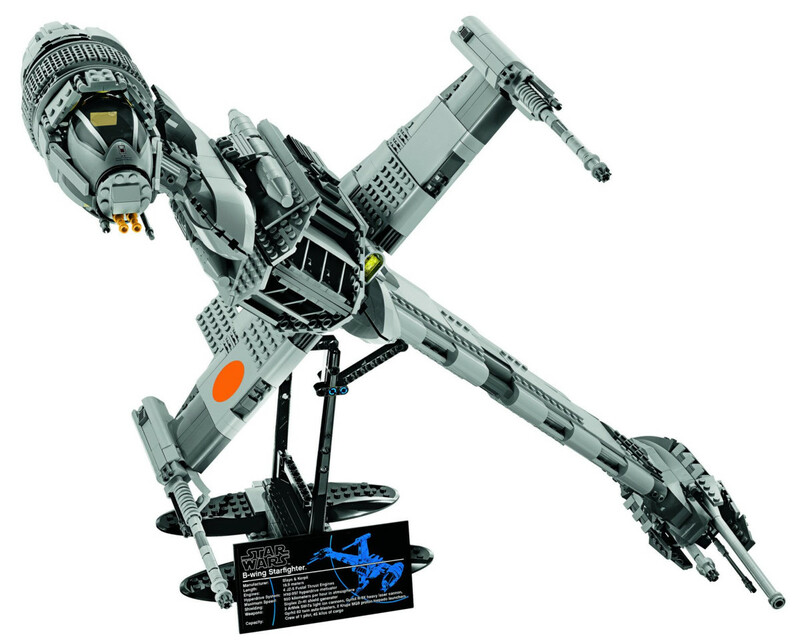 It has three retractable legs for its landing gear. The cockpit can detach from the ship and act as an escape pod. 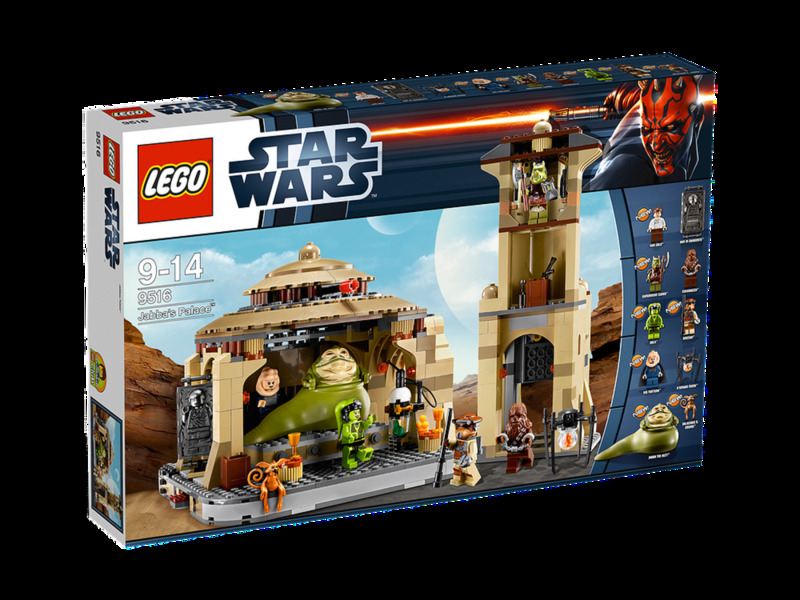 The Even Piell and R3-D5 minifigures made their debut in this building set. The Fury-Class Imperial Interceptor was primarily used as a transport vehicle within the Sith Empire, during the Great Galactic War and following Cold War. The cockpit can be moved up and down, allowing one minifigures to sit at the controls. Two passengers can be transported by lifting the rear hull up and exposing the cabin. The wings of the ship are divided into two sections. The front stay in one position, but the rear can be folded in and out for landing or flight mode. The tip of each wing is armed with two long flick-fire missiles. As the main fighter in the Imperial Empire's military, these twin ion engine ships were produced in mass numbers. 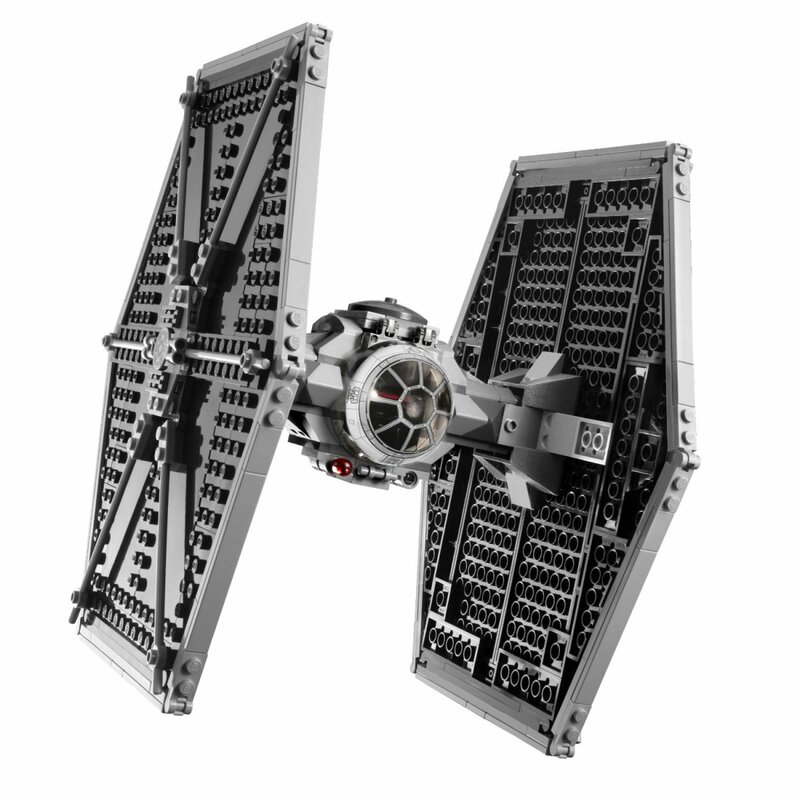 This would be LEGO's fifth standard sized TIE model. 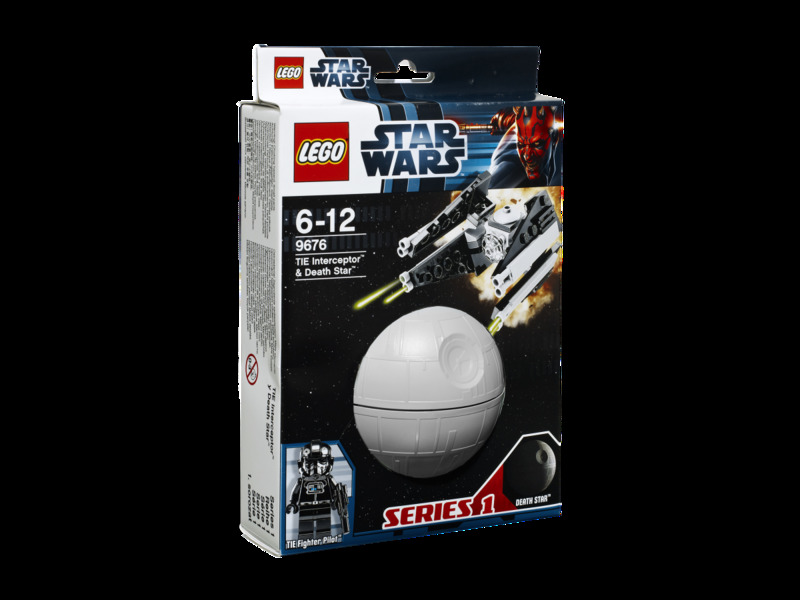 However, it was the first to use the stone grey color scheme being used for the most recent variations of the different types of TIE Fighters. It was armed with dual flick-fire missiles. A pilot minifigure fits in the ship by opening the cockpit. 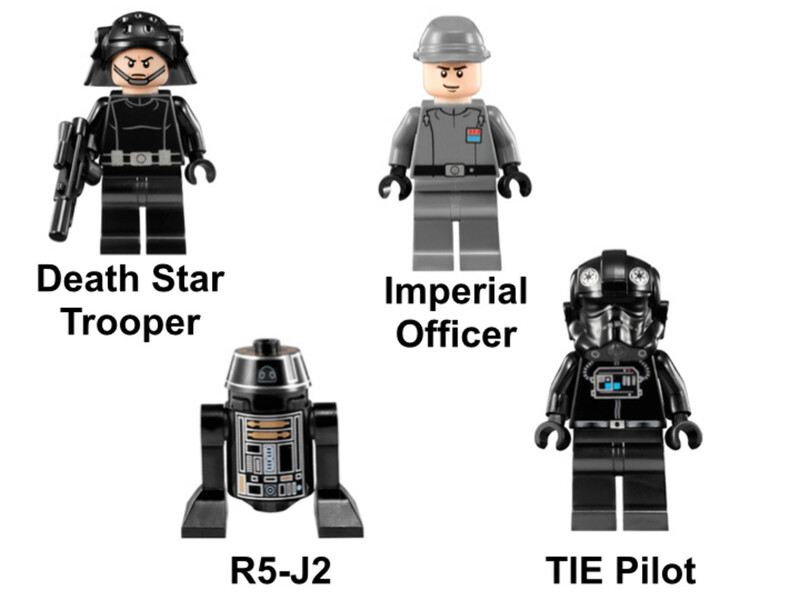 Although Astromech droids were not used for TIE Fighters, this set would contain the first R5-J2 Minifigure. 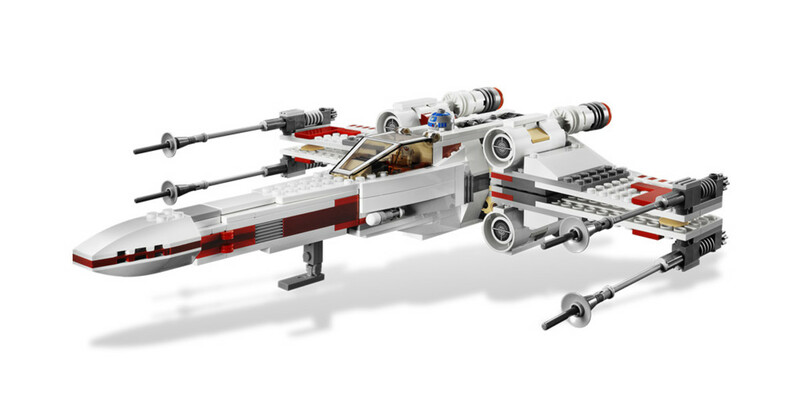 The T-65 X-Wing Fighters are the most iconic fighters in the Rebel Alliance's fleet. 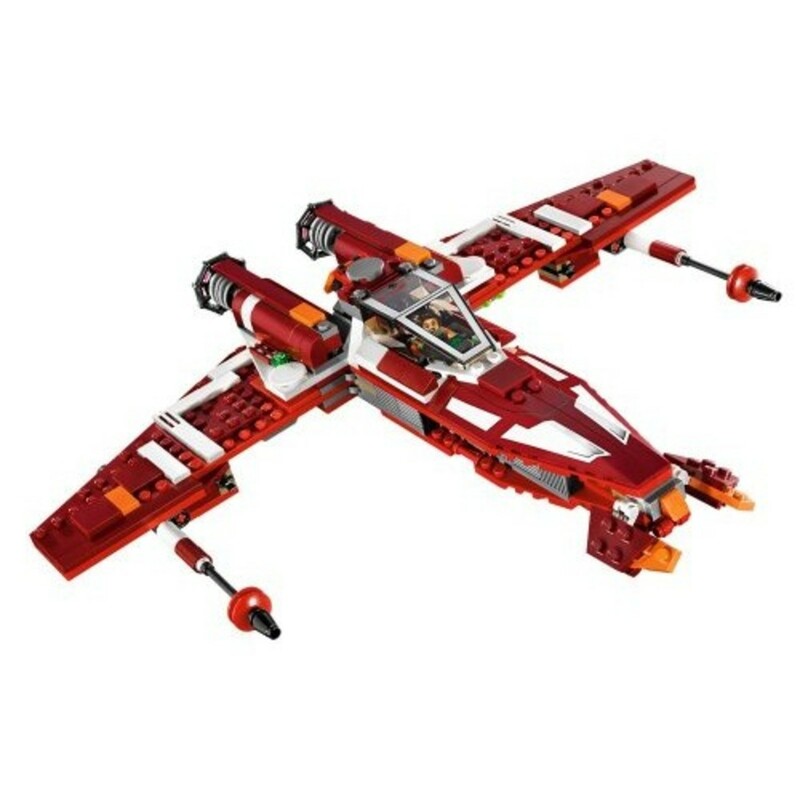 This would be the seventh LEGO model of the X-Wing. 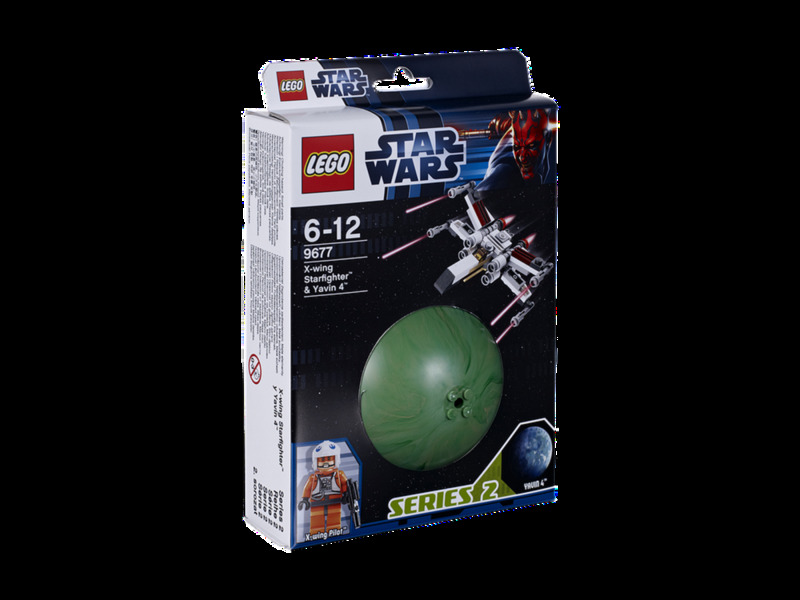 The building set is based on the the Battle of Yavin. The model has many of the interactive features found in most of the previous building sets. 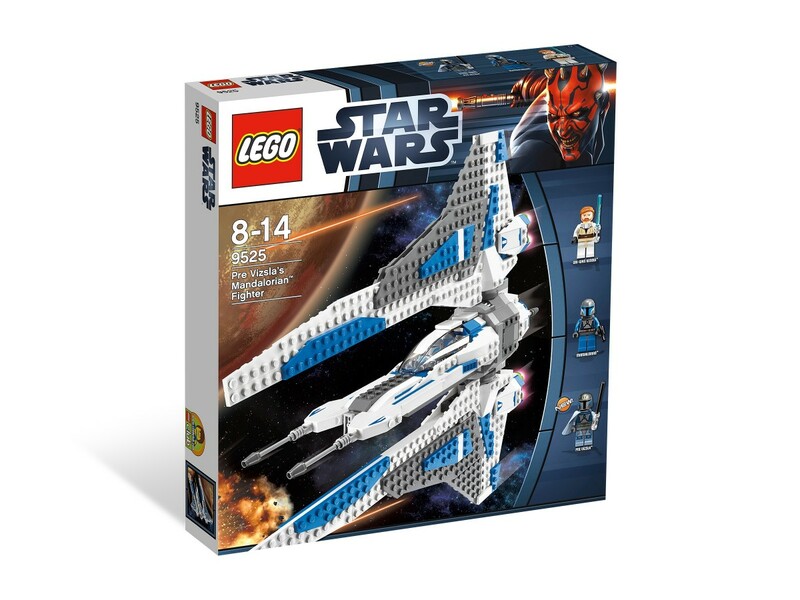 The ship has an opening cockpit, retractable landing gear, proton torpedoes and its signature opening/closing wings. 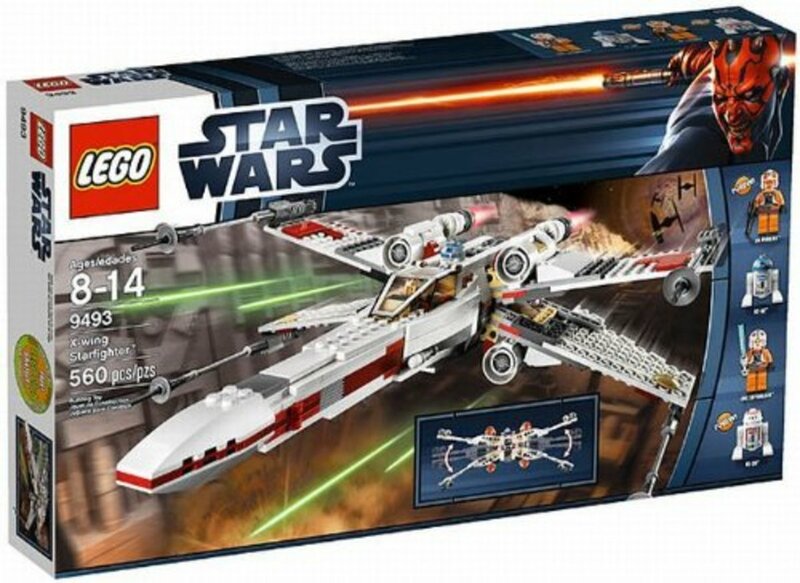 What sets this model apart is the extra wing markings to make it either Red 5's (Luke Skywalker) or Red 6's (Jek Porkins) Starfighter. 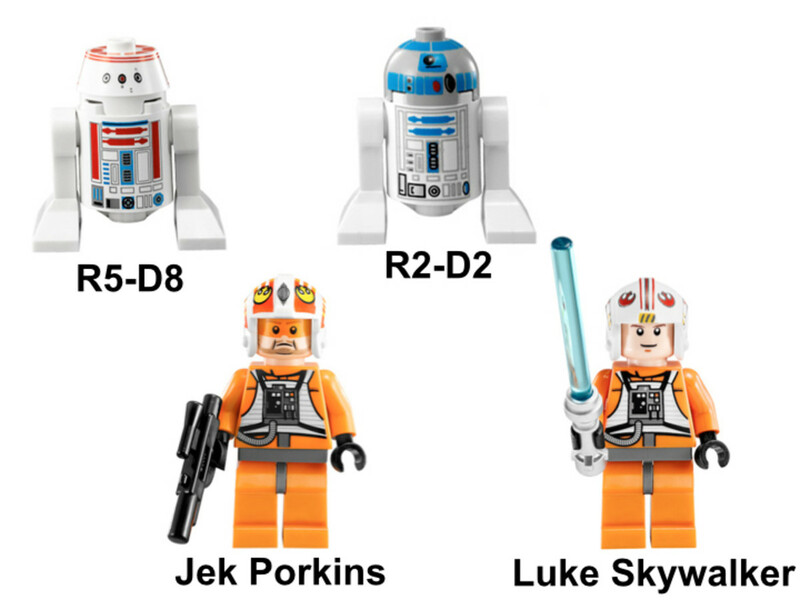 Tough decision, because Luke lives and Jek dies in the battle, but Jek Porkins and his R5-D8 Astromech droid were first available in this set. 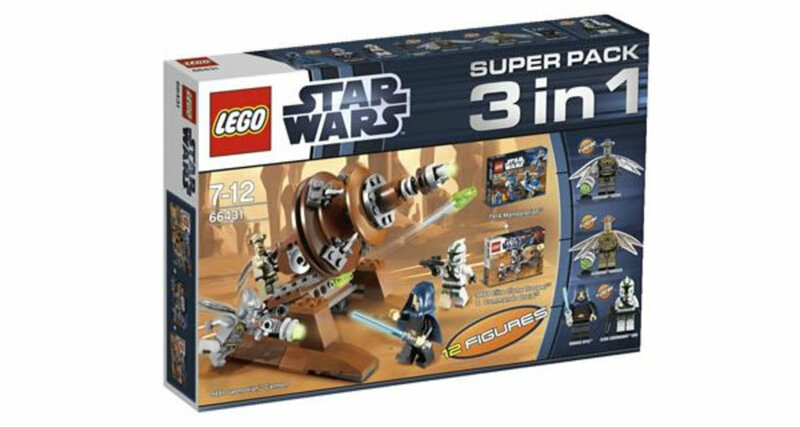 This combo pack includes Elite Clone Trooper & Commando Droid Battle Pack 9488, Endor Rebel Trooper & Imperial Trooper Battle Pack 9489 and Gold Leader's Y-Wing Starfighter 9495. 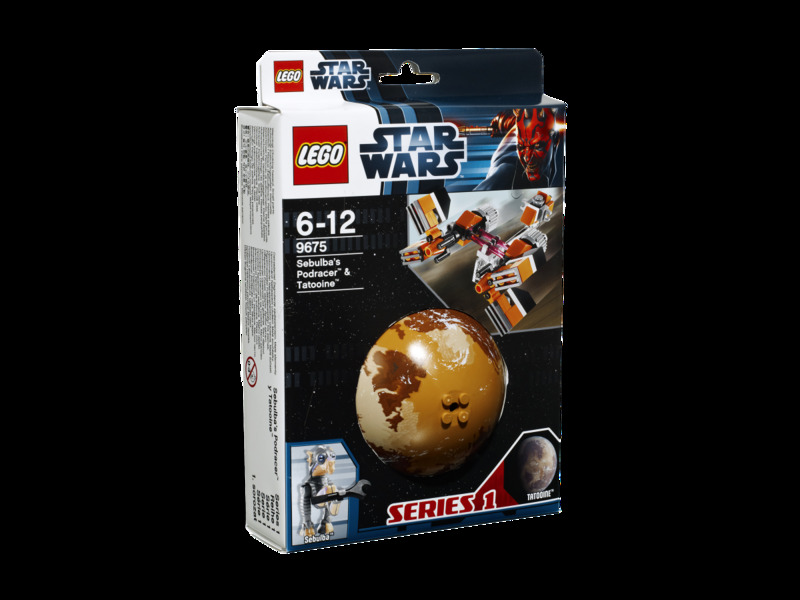 The sets in this combo pack focus on the battle of Geonosis. 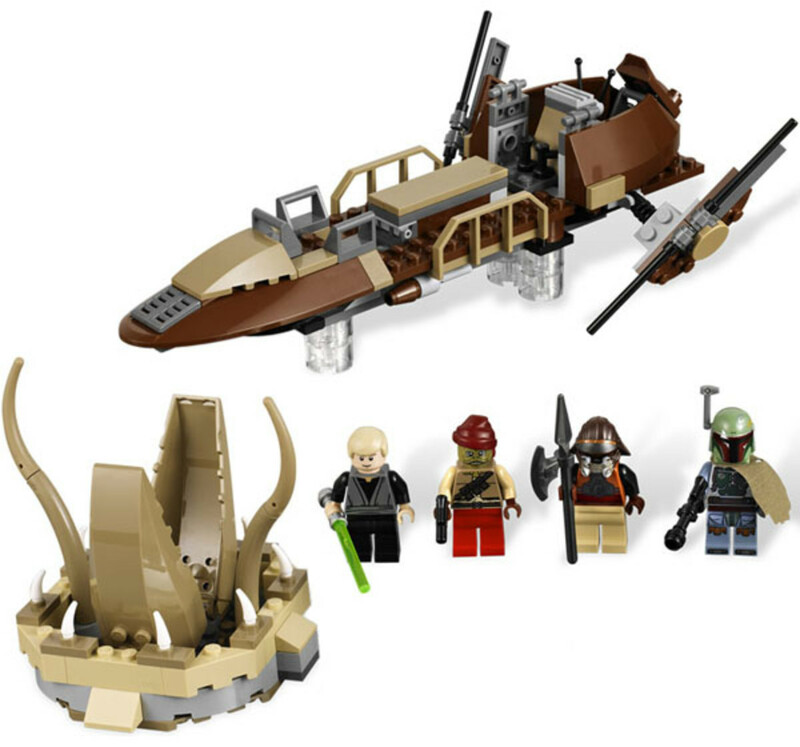 It includes Mandalorian Battle Pack 7914, Elite Clone Trooper & Commando Droid Battle Pack 9488 and Geonosian Cannon 9491. 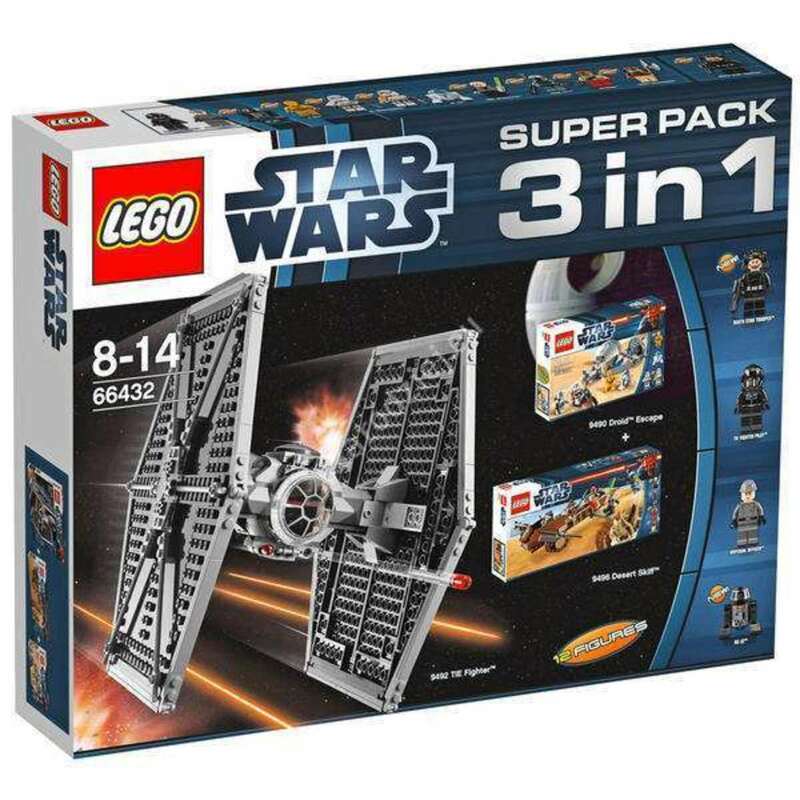 The original Star Wars trilogy is the theme for this combo pack. 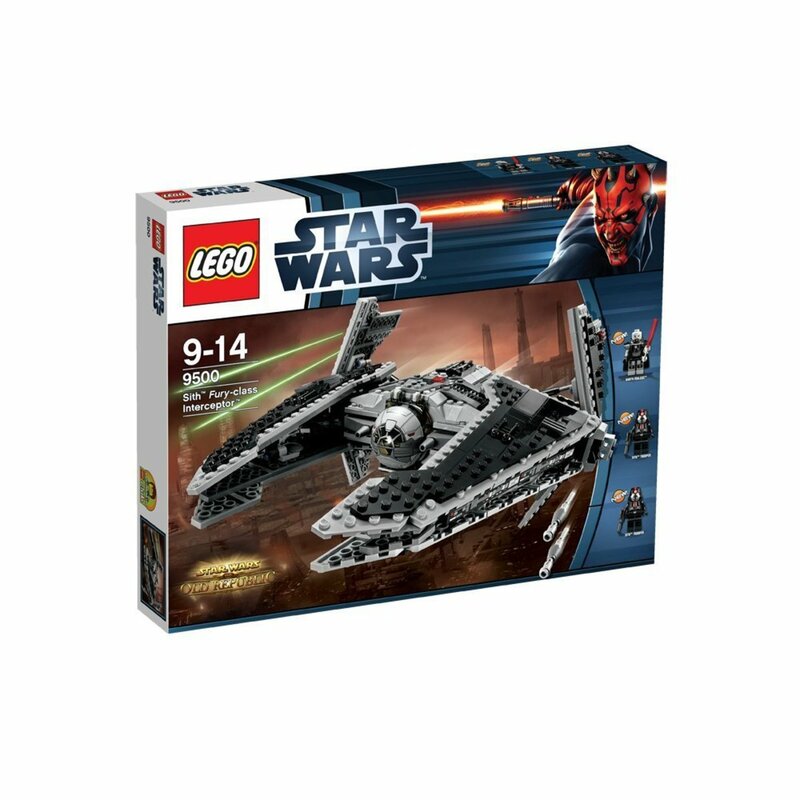 The box contains Droid Escape 9490, Desert Skiff 9496 and TIE Fighter 9492. 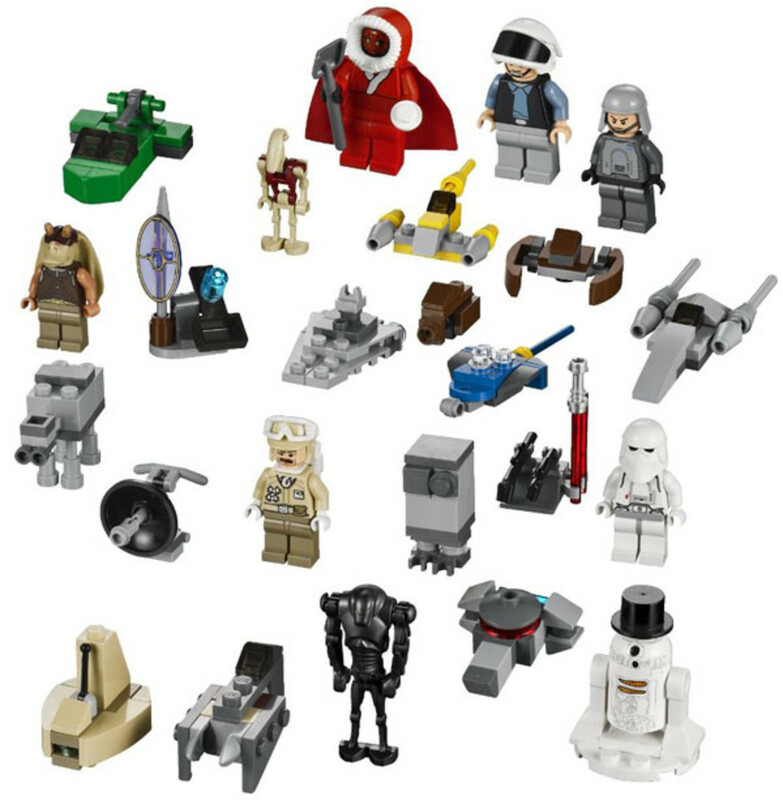 The mini building sets are smaller than minifigure scale, but this year LEGO included minifigure with several of these polybag sets. Anakin built his own podracer, to compete in the races on Tatooine. These craft had huge engines loosely attached to smaller cockpits. 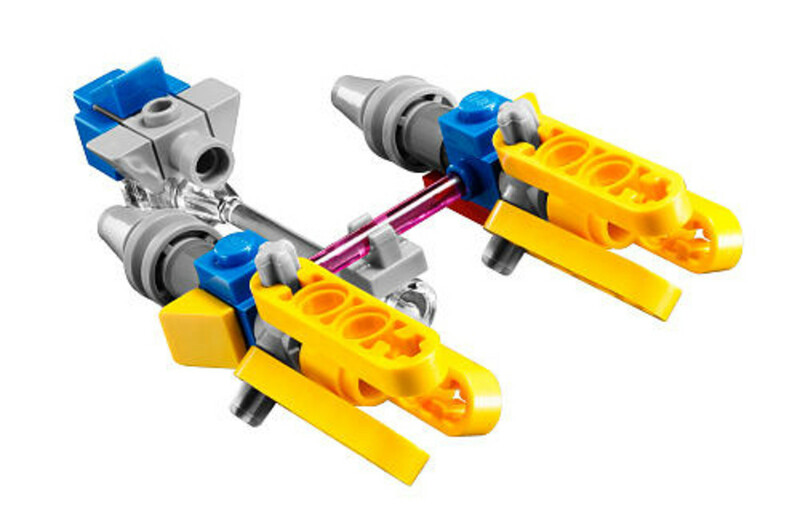 In order to create this unique design, LEGO used TECHNIC pieces for the engines. 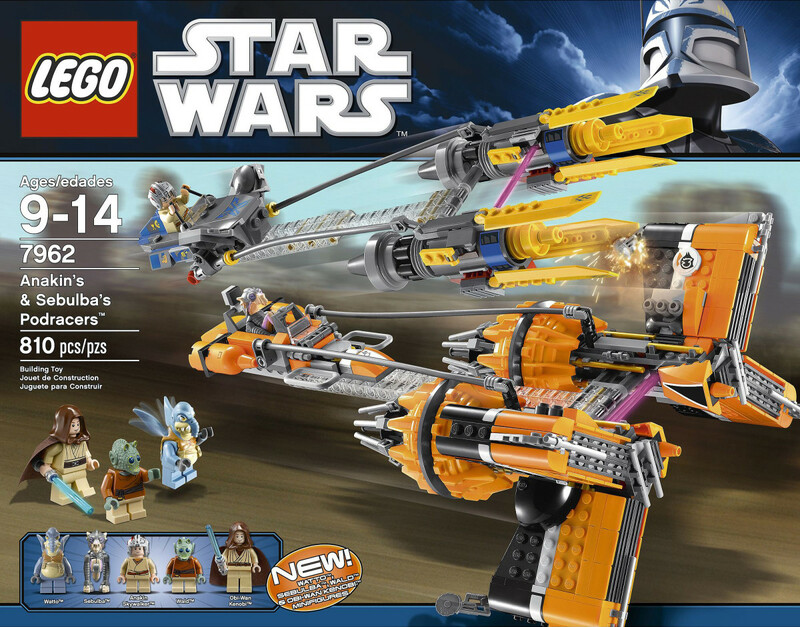 As a mini building set, it does not include a minifigure, but is built to scale with 9675 Sebulba's Podracer and Tatooine, so you can create a mini race. Bespin is a gas giant in the Bespin System. This Outer Rim planet was mined for tibanna gas by many colonies. One of these mining outpost was Cloud City. The vehicle most identified with Bespin are the Cloud Cars that escorted the Millennium Falcon to the city's landing platform. The 2" long Twin-Pod Cloud Car was the first model of the Cloud Car created by LEGO. 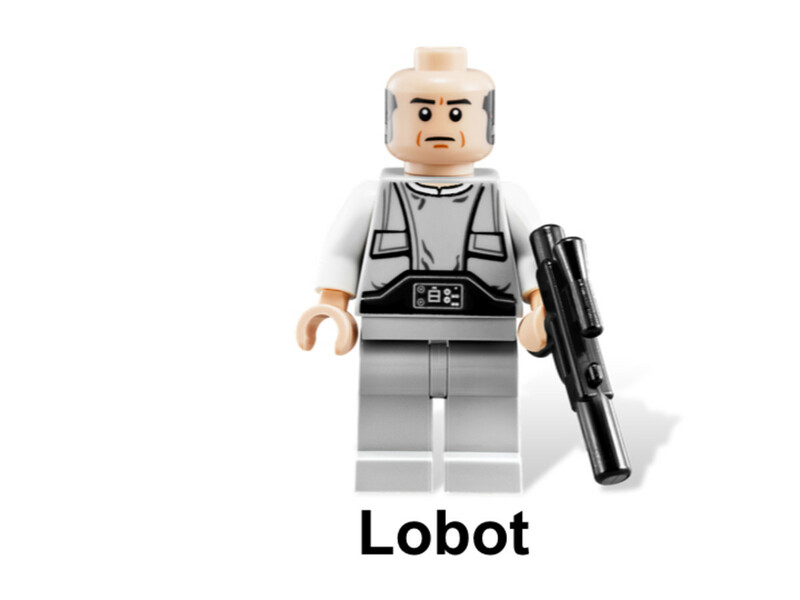 This is also only the second set to include a Lobot minifigure and he was given a new design. 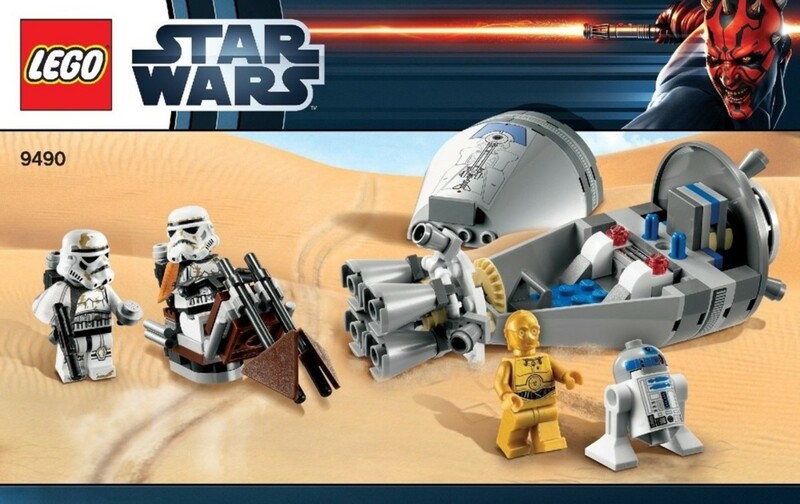 I found this set listed as being released in 2012, but could locate no more information. 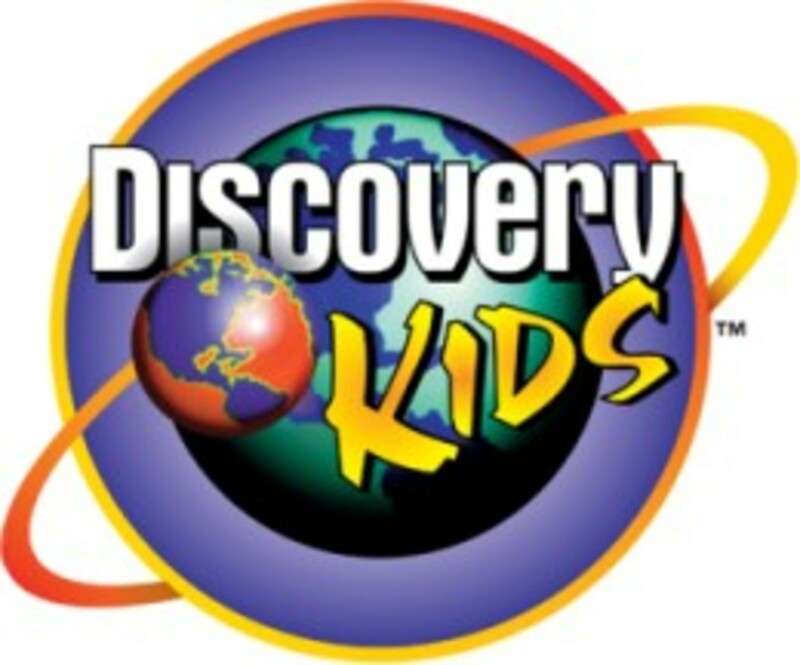 Please, feel free to add information in the comment section below. 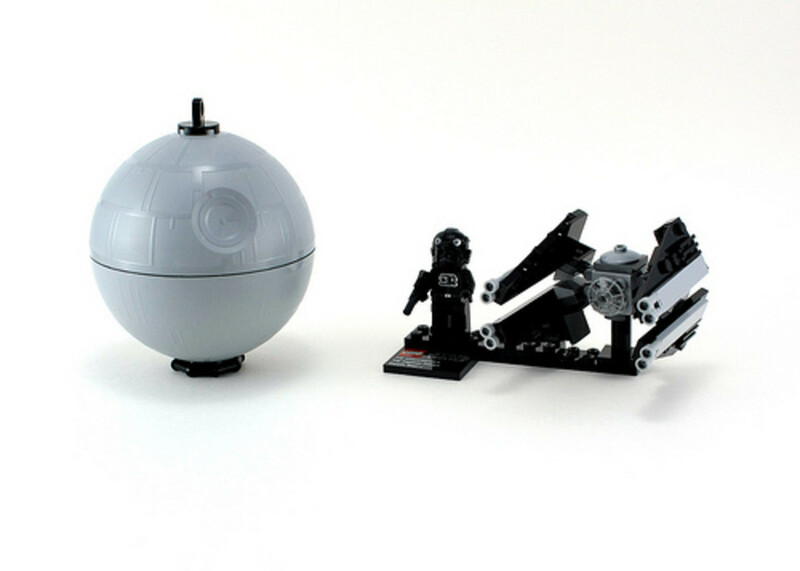 LEGO simply named this building set Tank, but it is more accurately the MTT. The Multi Troop Transport doubled as a tank and battle droid carrier. 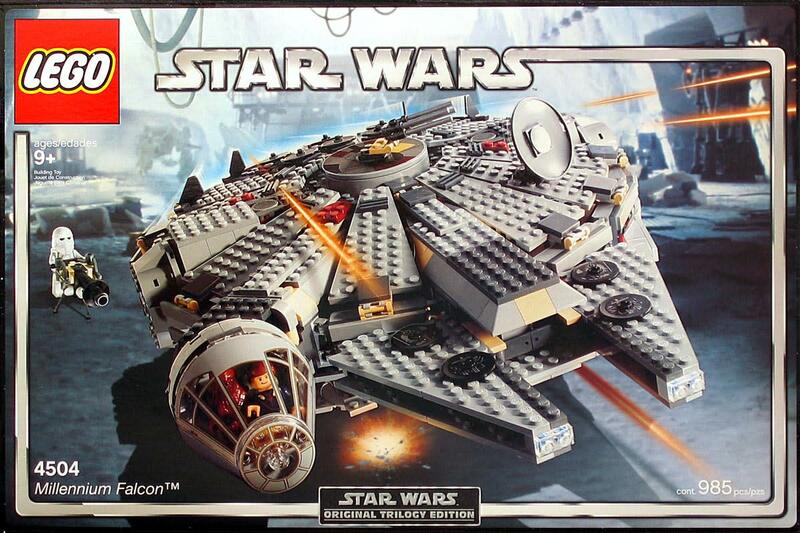 The use of blue bricks makes it from the Separatist of the Clone Wars and not the Trade Federation. 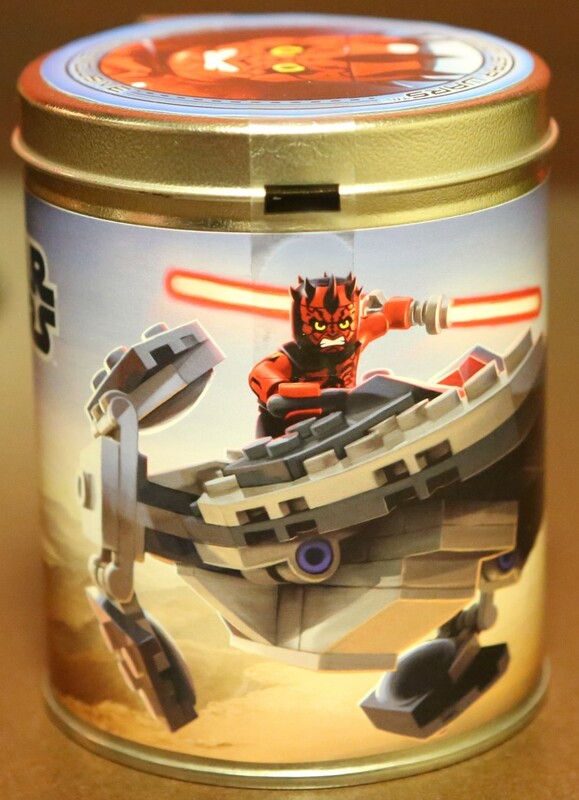 The Mini Sith Infiltrator was given away at the 2012 San Diego Comic-Con. As a promotional set, it came with more than just a miniature model of the ship. 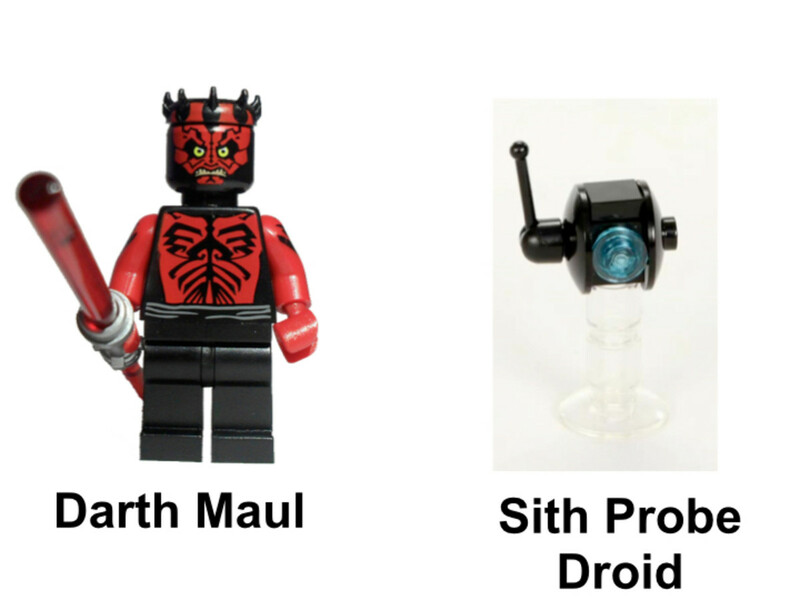 It also included a Darth Maul Minifigure and Sith Probe Droid. 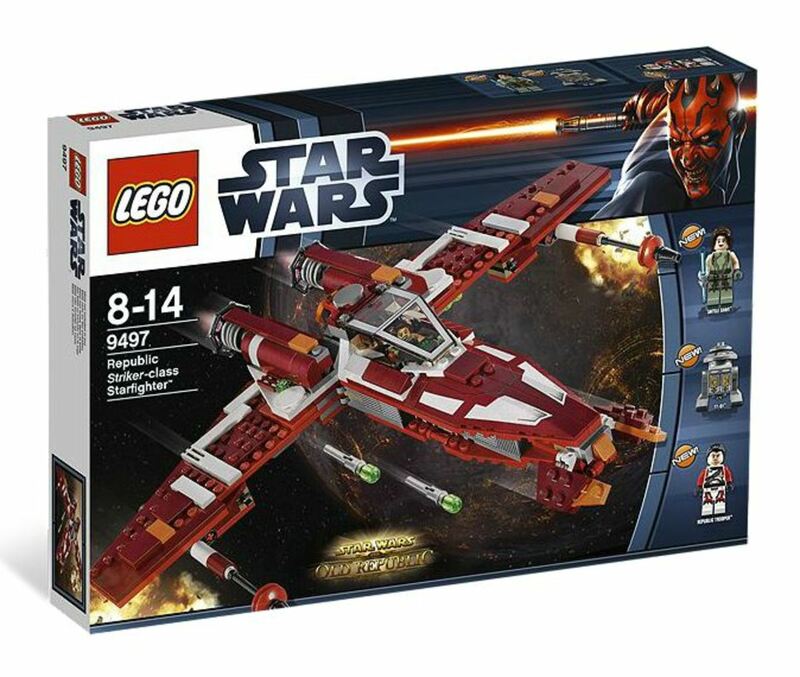 I found this set listed on Brickset, but could locate no more information. Please, feel free to add details in the comment section below. The brown coloring of this Single Trooper Aerial Transport makes it part of the Trade Federation, before they joined the Confederacy of Independent Systems during the Clone Wars. 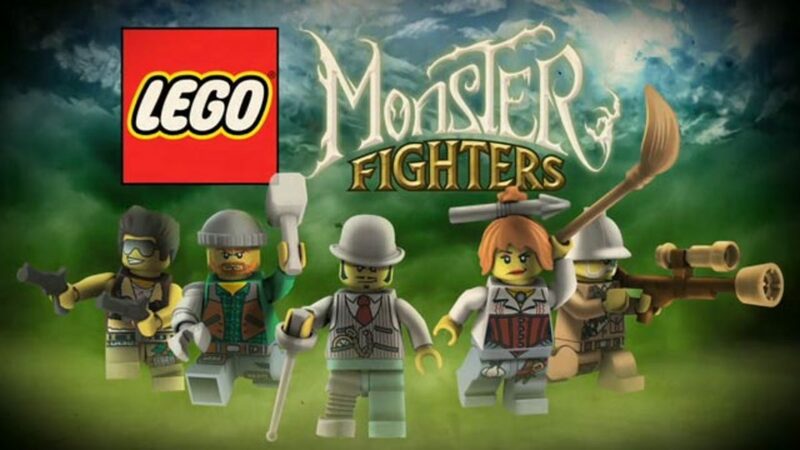 This would be one of the few mini building sets to include a Minifigure and have it pilot the model realistically. This is thanks to the STAP's small design and use of speed for defense, instead of armament. 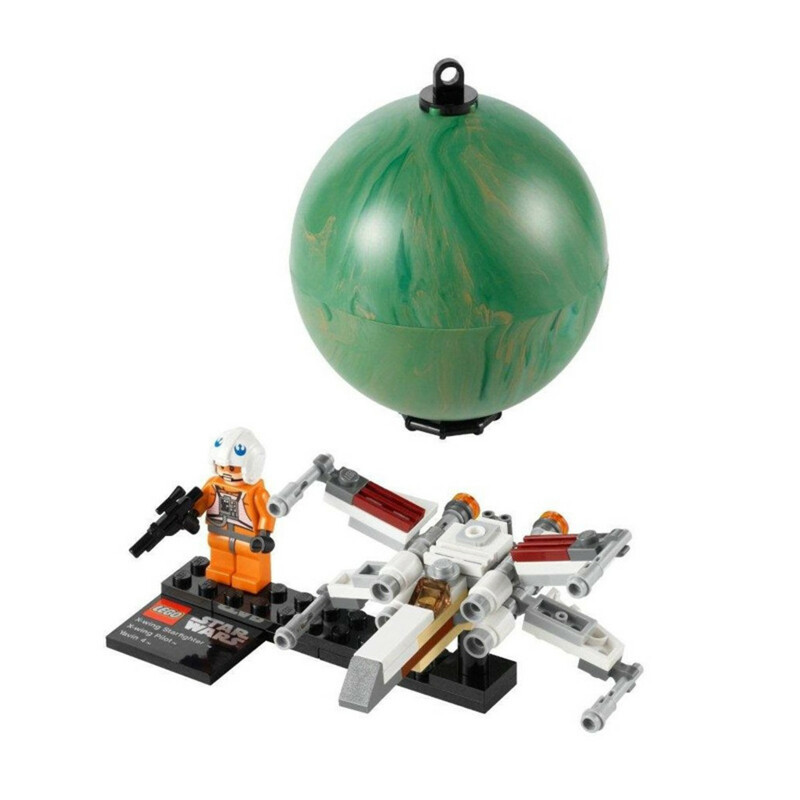 The set comes with a clear stand to give the appearance of the ship hovering above the ground. The TC-series protocol droids were very similar to C-3PO in appearance. 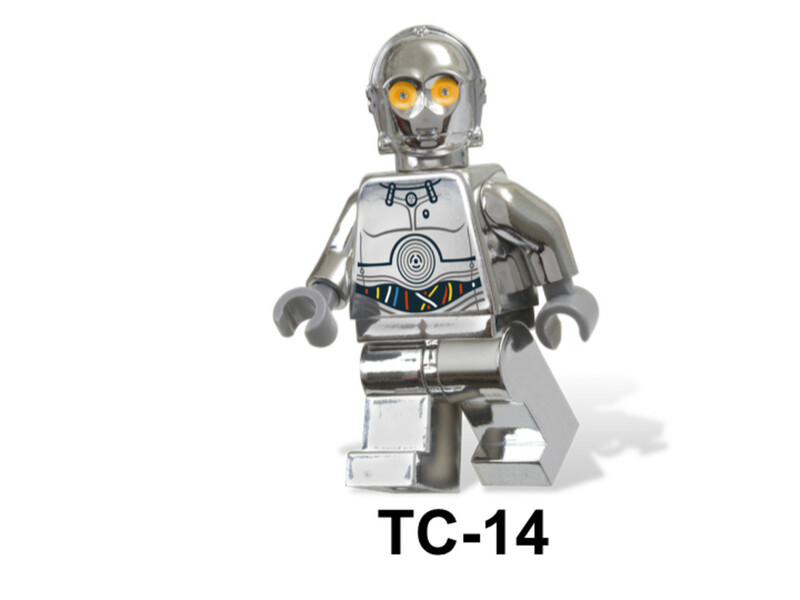 TC-13 was colored a shiny silver and programmed with a feminine voice. She greeted Qui-Gon and Obi-Wan aboard the Trade Federation Lucrehulk-class battleship Saak'ak, when they were supposed to negotiate an end to the blockade of Naboo. 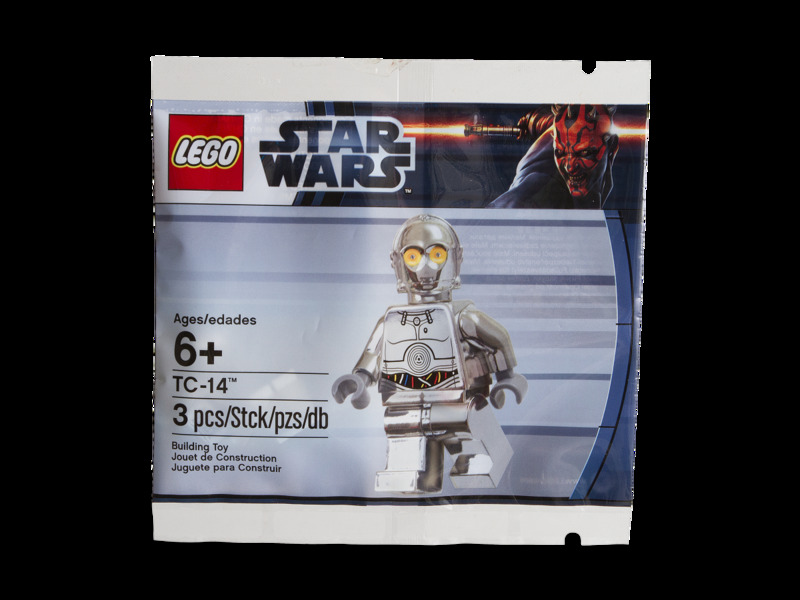 The minifigure was originally included with a minimum purchase of Star Wars sets at LEGO stores and online for the May 4th celebration, that lasted till May 5th. 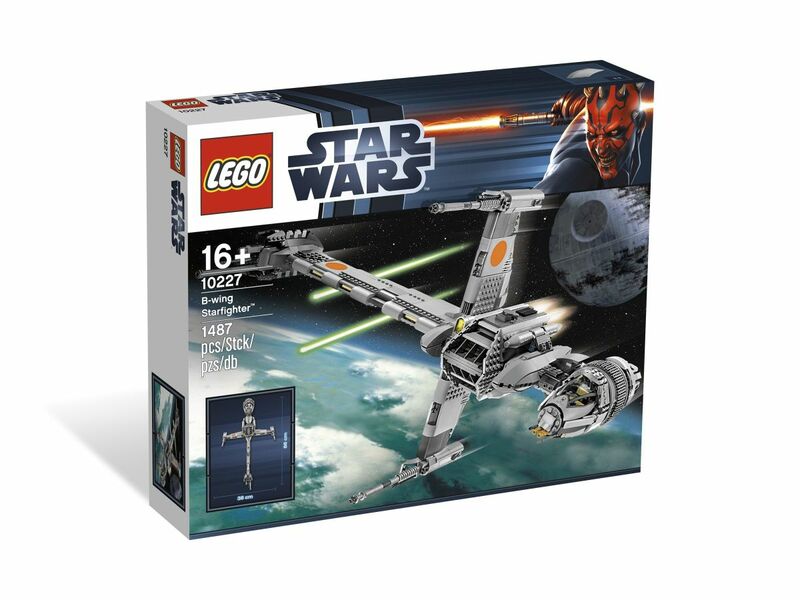 It was later given away for the month of October and again with the purchase of the 10227 B-Wing building set. 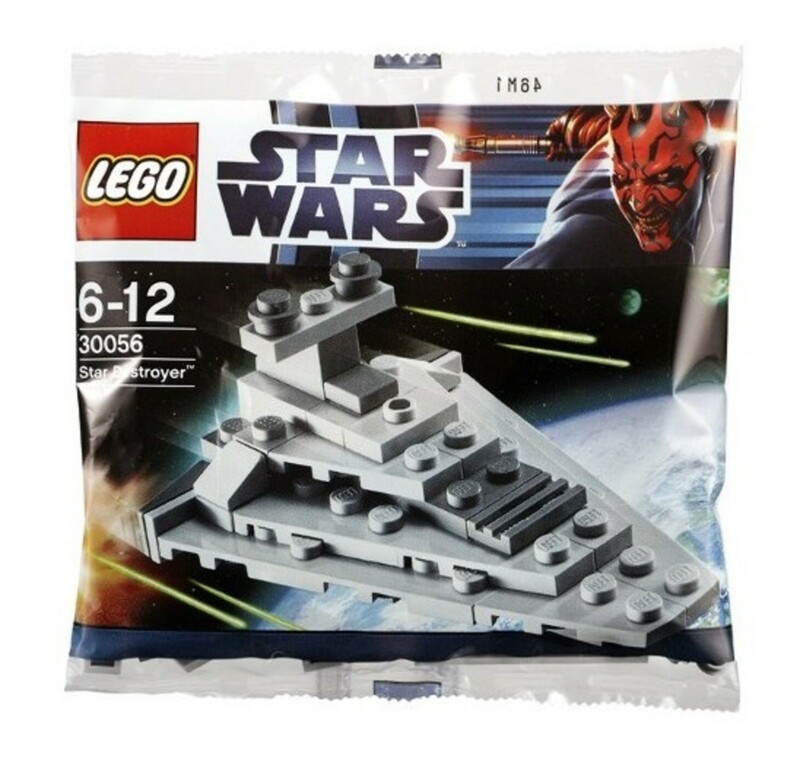 LEGO has created several mini Star Destroyer models, since introducing the mini scale to the Star Wars theme. 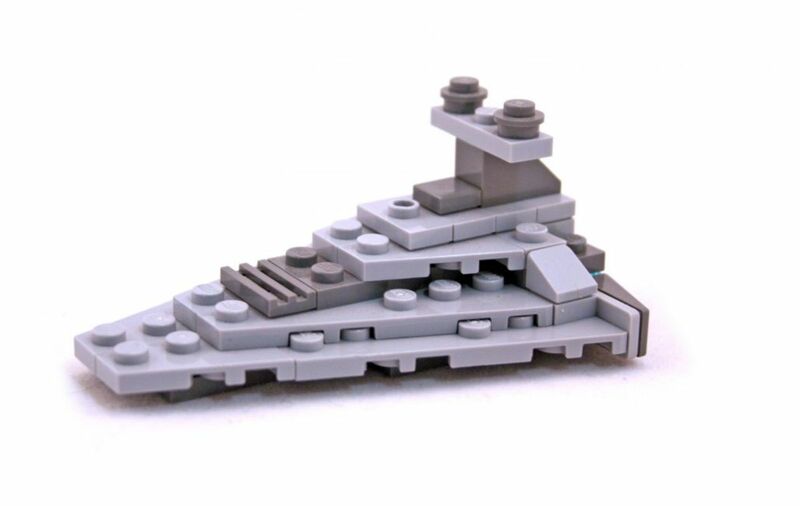 It was a practical solution to letting more fans add these large capital ships to their collection. Full scale models required a significant amount of pieces and money to build. The set could be bought in the United States at Walmart stores across the country. However, UK residents were only able to get it as a promotional set included in the May 23rd issue of The Sun / News Of The World newspaper. 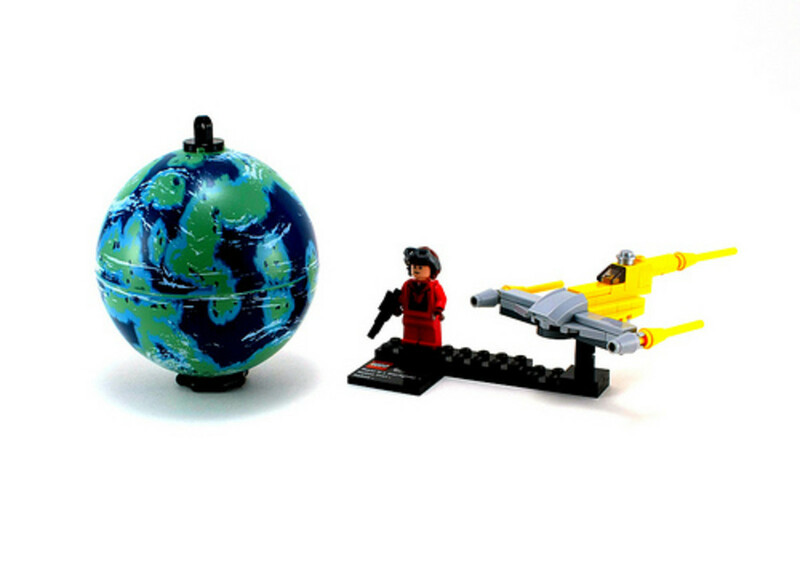 These building sets included a mini model, a minifigure, a planet/moon that were a little over 3" in diameter and a display stand. The planets/moons opened up and doubled as a storage container. 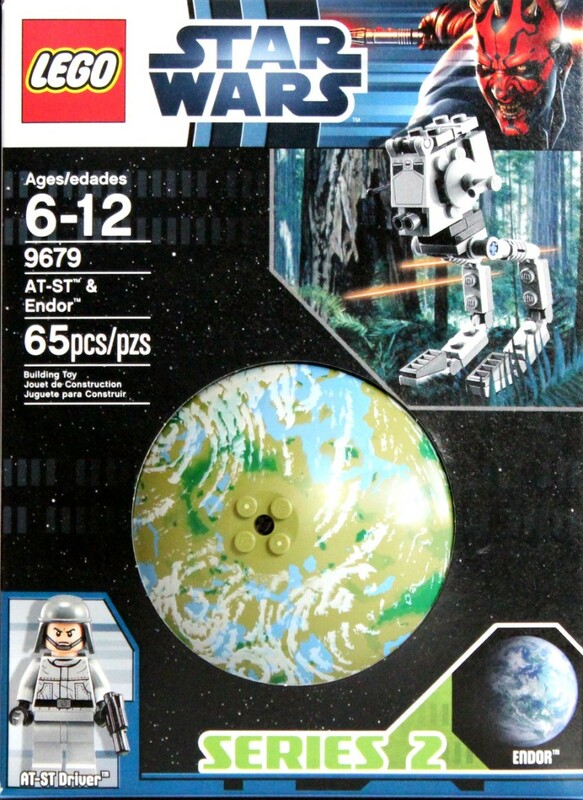 Although LEGO describes the set as the planet Endor, it is actually the forest moon of Endor. This is a common mistake, since the second Death Star's shield generator was located here and the moon became more well known than the planet. 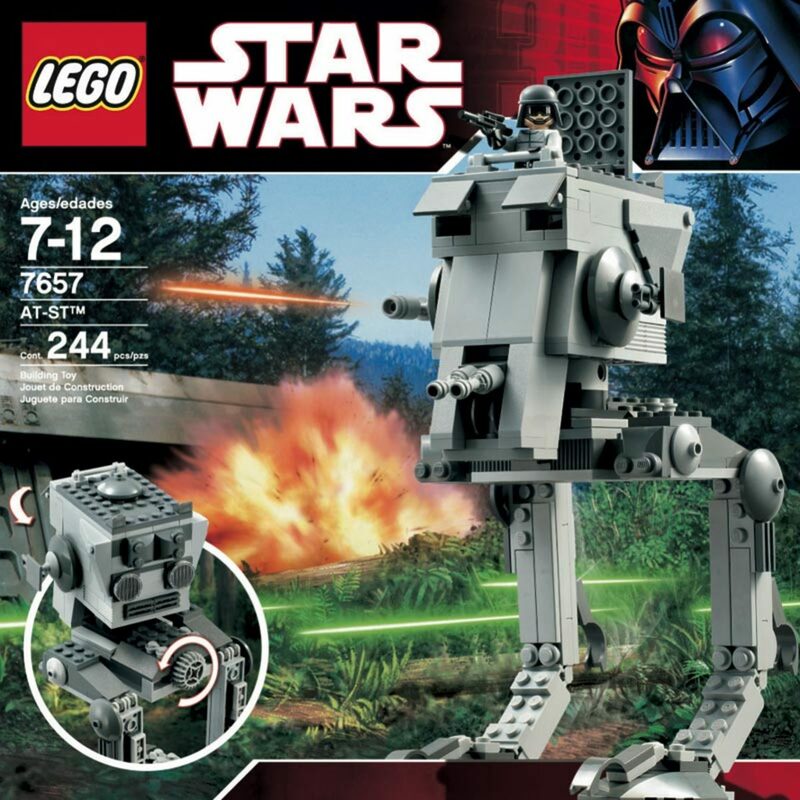 The 3" high AT-ST is very similar to the model included in 4486 AT-ST and Snowspeeder. The model's legs are possible to create its distinctive chicken walk. 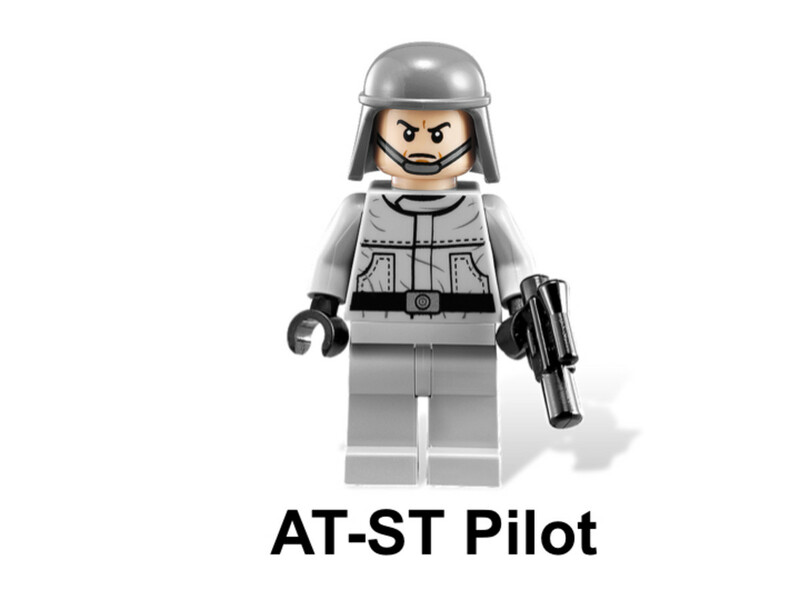 The AT-ST Pilot minifigure was redesigned for this set. The planet Naboo was central to Episode 1's plot. When the Trade Federation set up an illegal blockade, it set off a string of events that would allow Chancellor Palpatine to dissolve the Republic and become Emperor of the Galactic Empire. 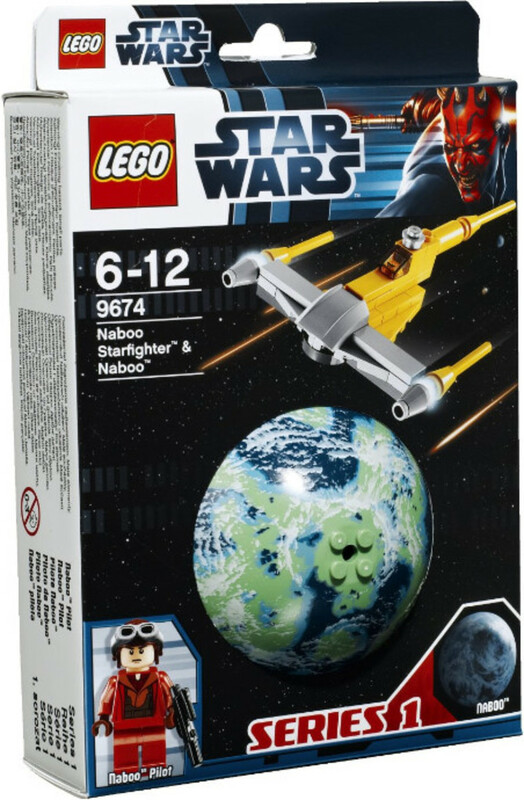 This was the fifth model of the Naboo Starfighter released by LEGO. As the main fighter of the planet, the 4" long model is a perfect fit for this combo. 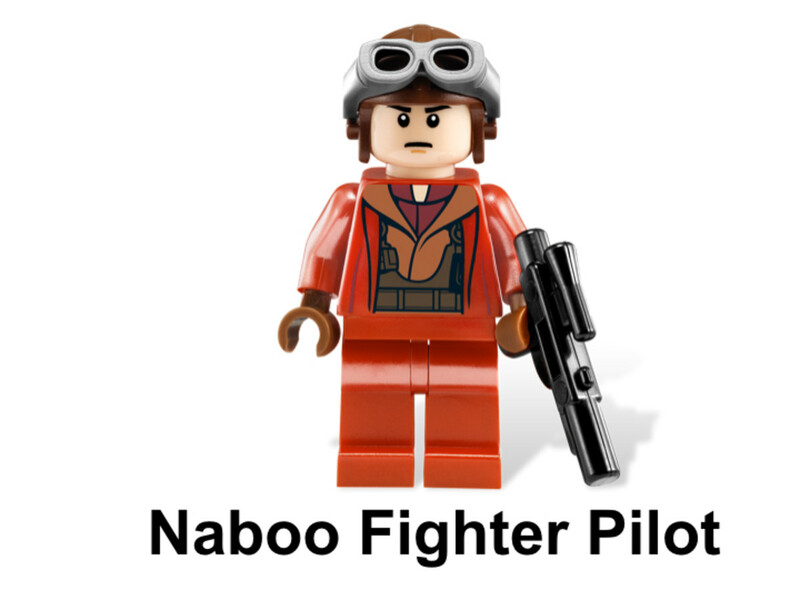 Of course, the Minifigure is a Naboo Fighter Pilot. Tattooing is a desert planet on the Outer Rim that should be of no significance, except it is where Anakin Skywalker was born, Obi-Wan went into hiding and Luke Skywalker was raised. 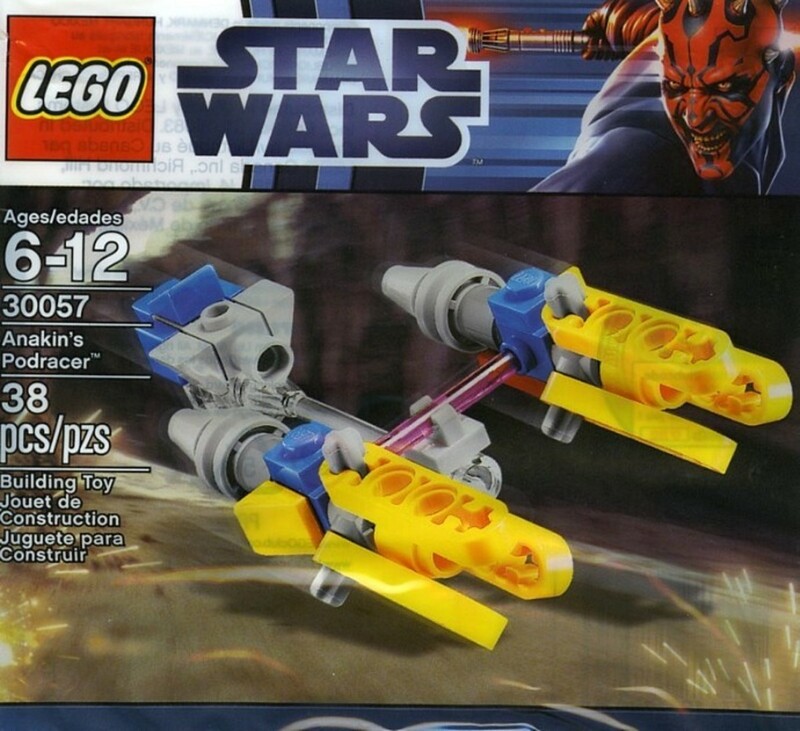 The vehicle used in this set is Sebulba's Podracer, that he piloted in the Boonra Eve Classic race. 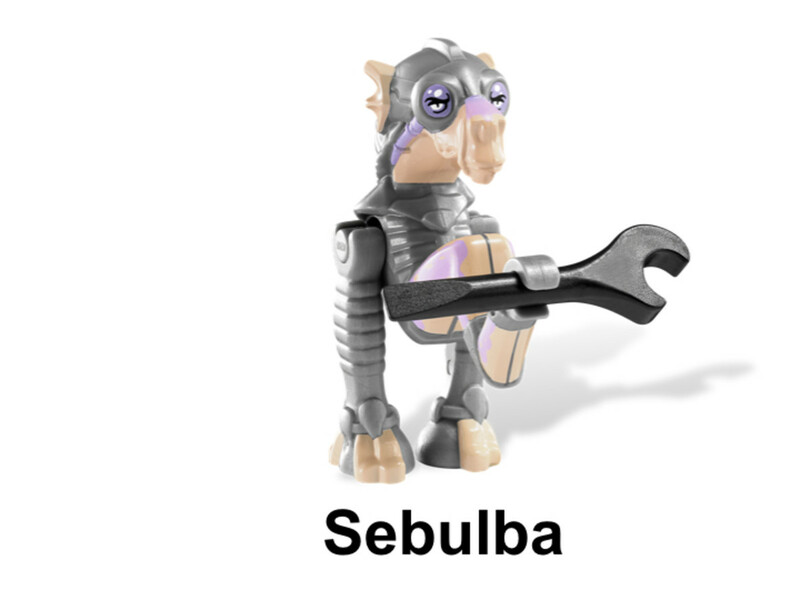 The Sebulba's Minifigure comes with a wrench for him to sabotage his opponents. Technically the Death Star is not a moon, but at 160 km across, it was mistaken as a small moon upon first being discovered by Han, Chewie, Luke and Obi-Wan. The space station was capable of destroying planets and large capital ships, but vulnerable to small fighters. The mini model in this set is the TIE Interceptor. 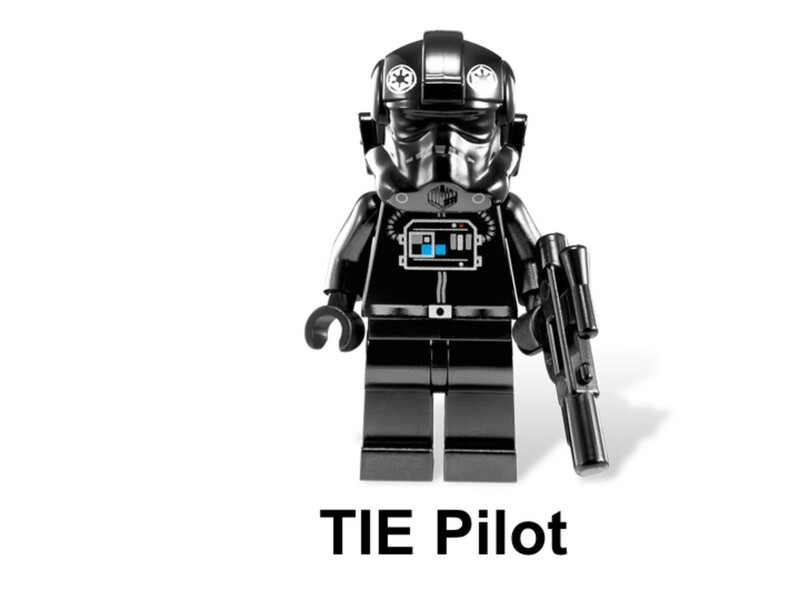 At only 2" long, the TIE Fighter Pilot Minifigure will not be fitting inside the vehicle. Yavin IV was the location of the secret base used by the Rebel Alliance in Star Wars: A New Hope. It was here that the Rebels were able to destroy the first Death Star. 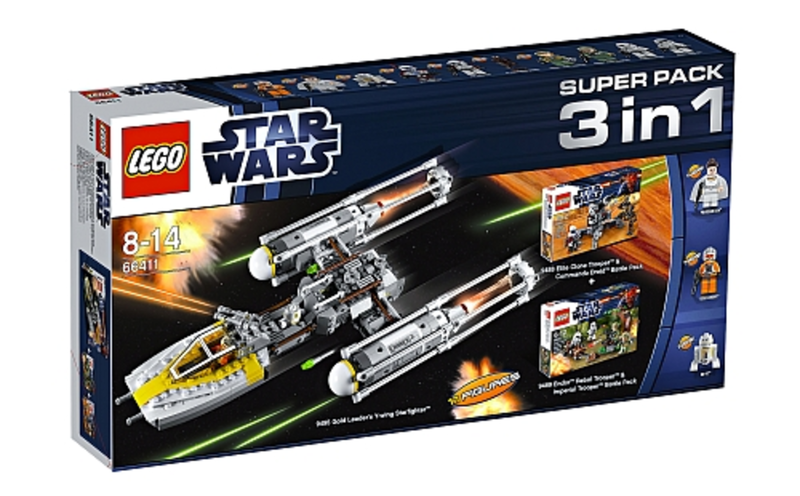 The 3" long X-Wing is very similar to 30051 X-Wing mini building set released in 2010. 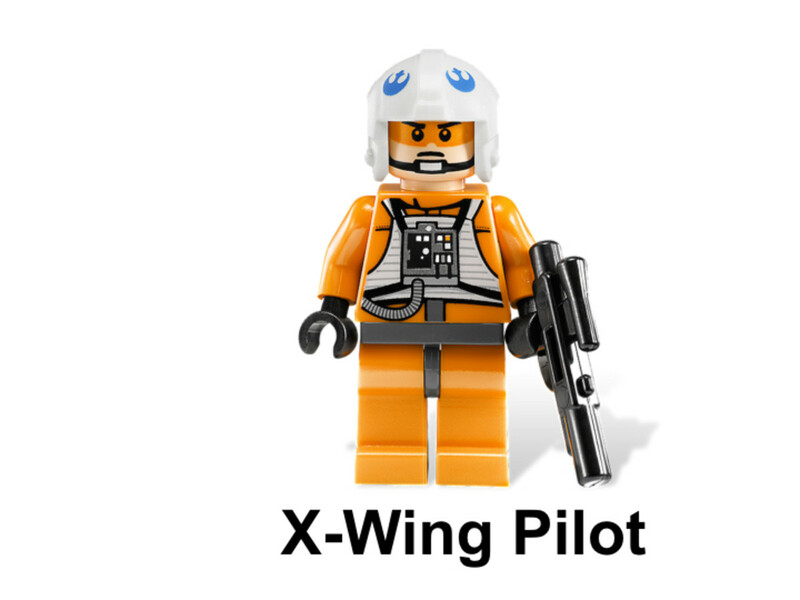 The minifigure is a standard X-Wing pilot and not based on a particular character. 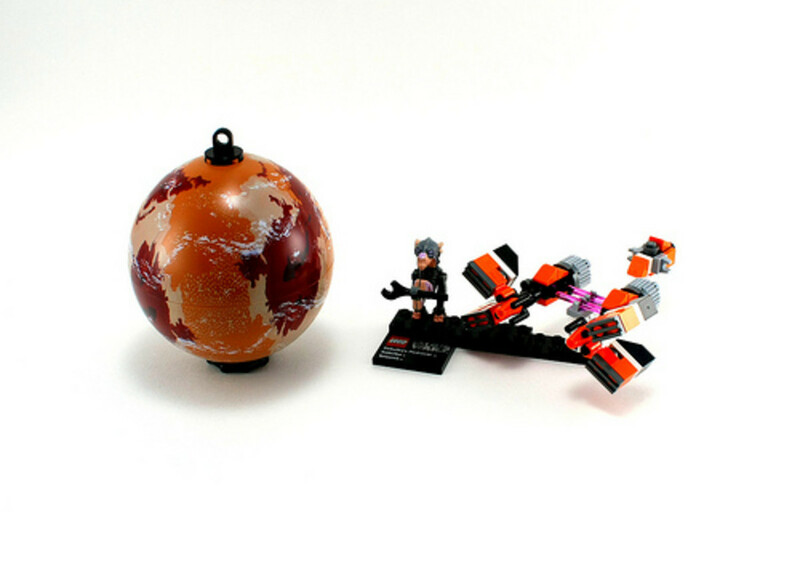 These large, detailed models have become a favorite among fans. 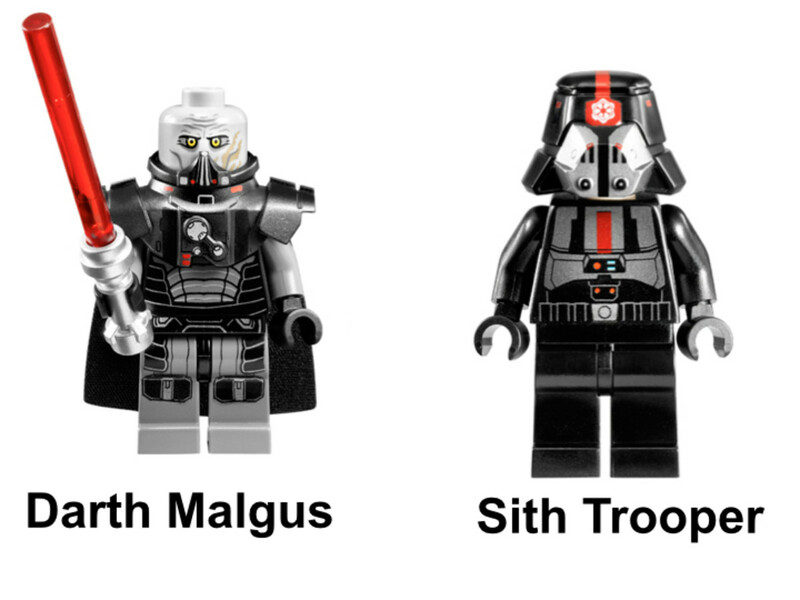 This year's models focused on the Rebel Alliance. 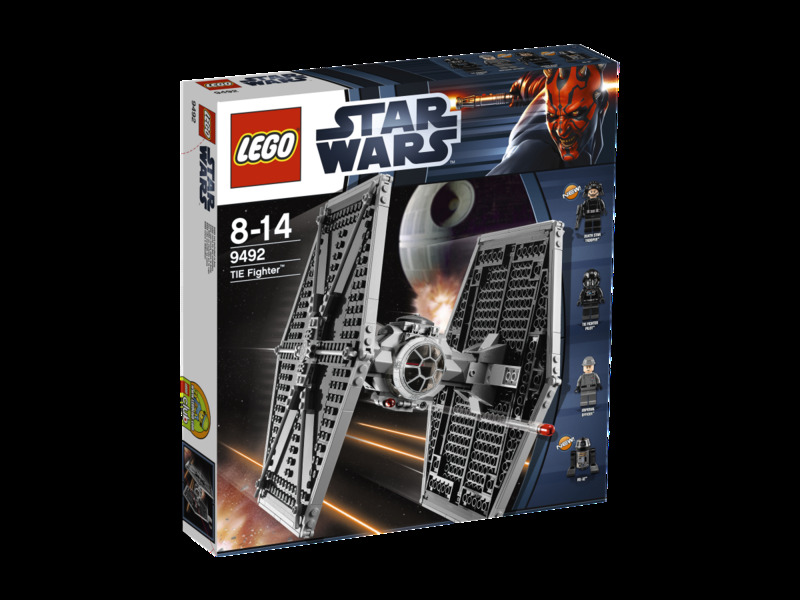 The B-Wing became the third UCS model of a Rebel fighter. 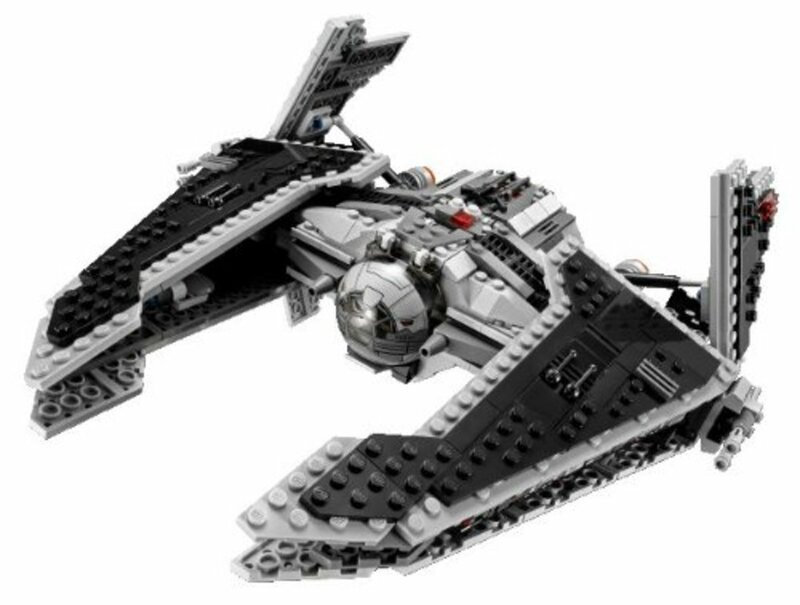 The B-Wing did not get a lot of screen time, but its unique design and dynamic flight movements made it stand out. This 26" wide model made sure to replicate it as close as possible. This includes the rotating and self-leveling cockpit. The wings were able to be positioned in both landing and flight mode. It comes with a display stand and information plaque, but these do not have to be used. 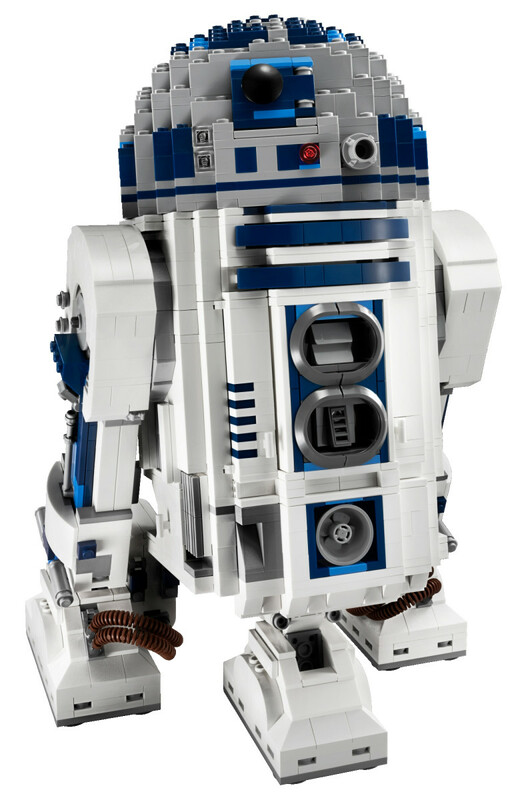 Rather than create a ship, builders construct a 12" high, 7" wide full bodied R2-D2 droid. 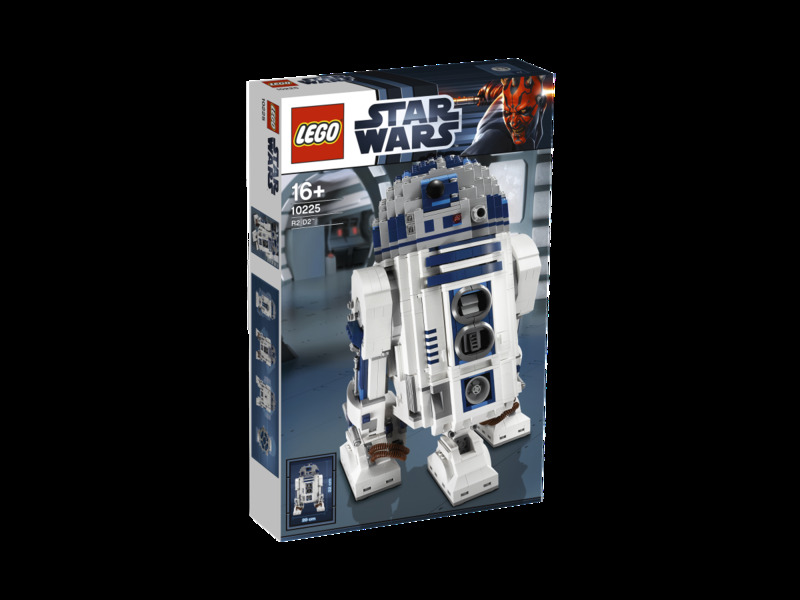 It was designed to highlight many of R2-D2's functioning parts. The black photoreceptor, red sensor, hologram recorder/transmitter and charger are all included in his exterior details. His front panel opens to expose the universal computer interface arm and circular saw. The R2-D2 model also had two fold-out spacecraft linkage control arms. A switch in the rear controls his retractable third leg. R2-D2's domed head can rotate, like it does in the movies. Minifigures have proven successful promotional items. These small characters can be more popular than the model itself. 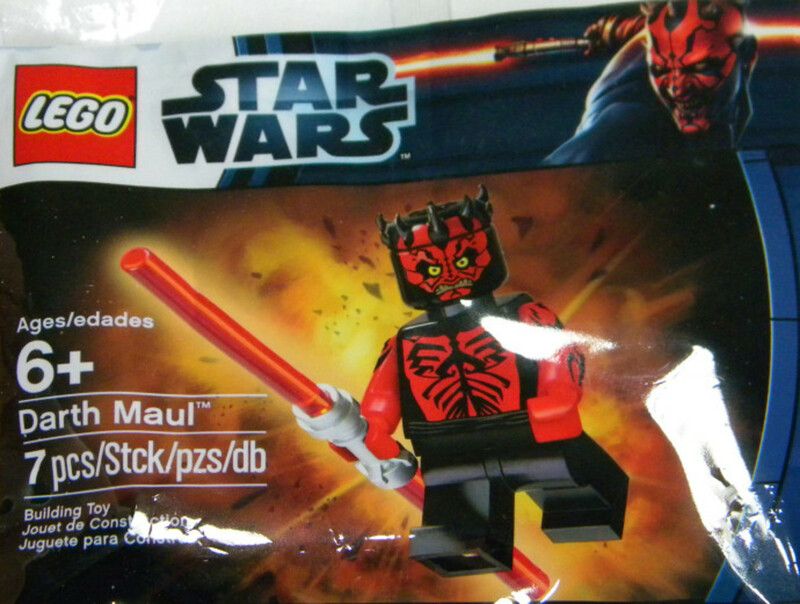 Darth Maul was only in the first film, but audiences loved him. 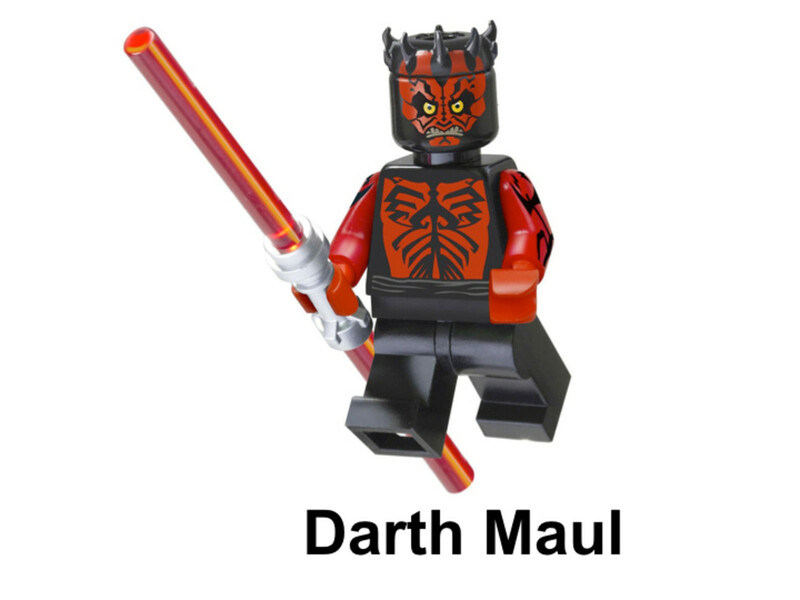 His double lightsaber and combat skills quickly made him one of the most popular Siths. Which is probably why writers made the decision to have him survive, after being cut in half by Obi-Wan Kenobi. 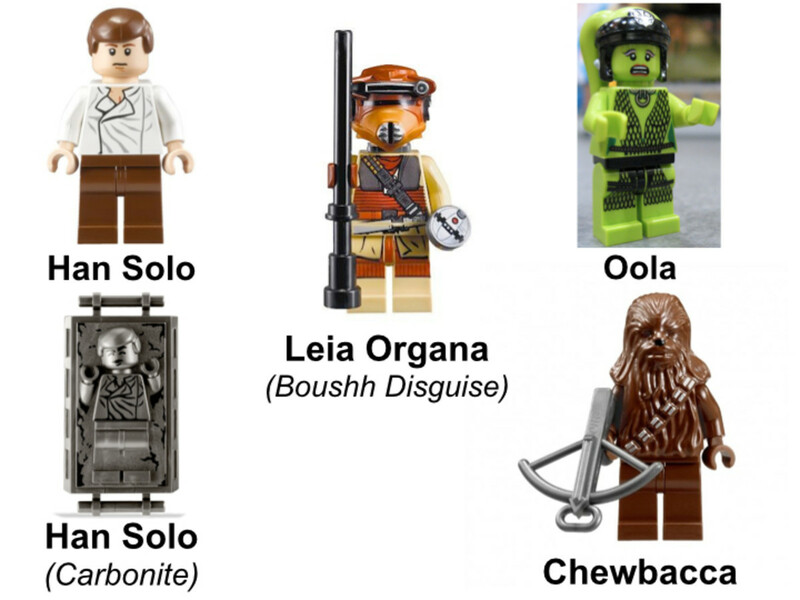 LEGO gave these minifigures away at the 2012 New York Toy Fair and as a contest participation prize during Star Wars Days at LEGOLAND California from March 31 to April 1. 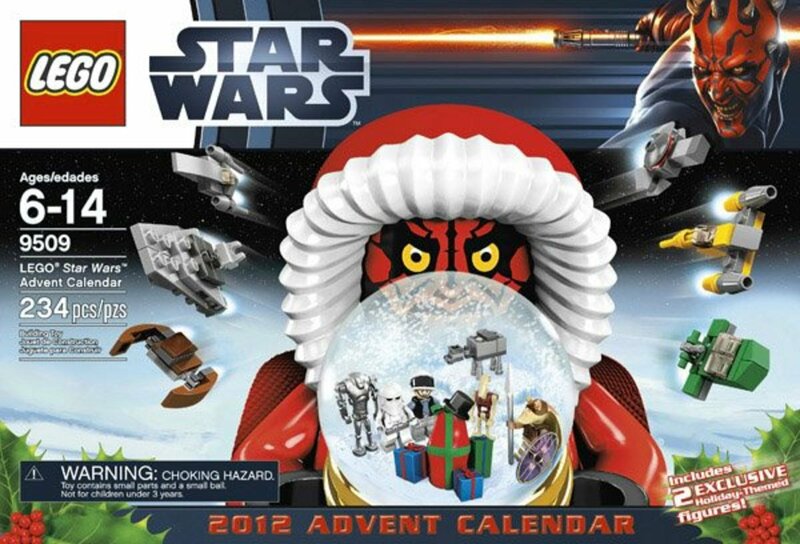 Unlike the Star Wars Holiday Special, the LEGO Star Wars advent calendar proved extremely popular and became a holiday tradition. 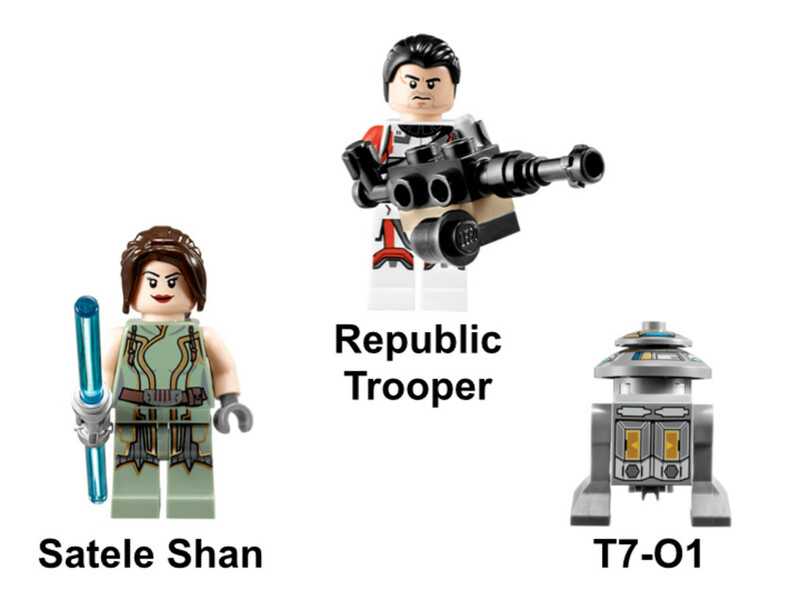 The first year only had one "holiday" characters, but for the second year LEGO included 2 of the popular and exclusive minifigures. To add even more fun for fans, each of the 24 doors leading up to Christmas had a code printed on the back. Builders could go to the official LEGO website, click on the picture of the advent calendar, click on the matching day, enter the code and then watch that day's model move. Watching Star Wars way too many times. 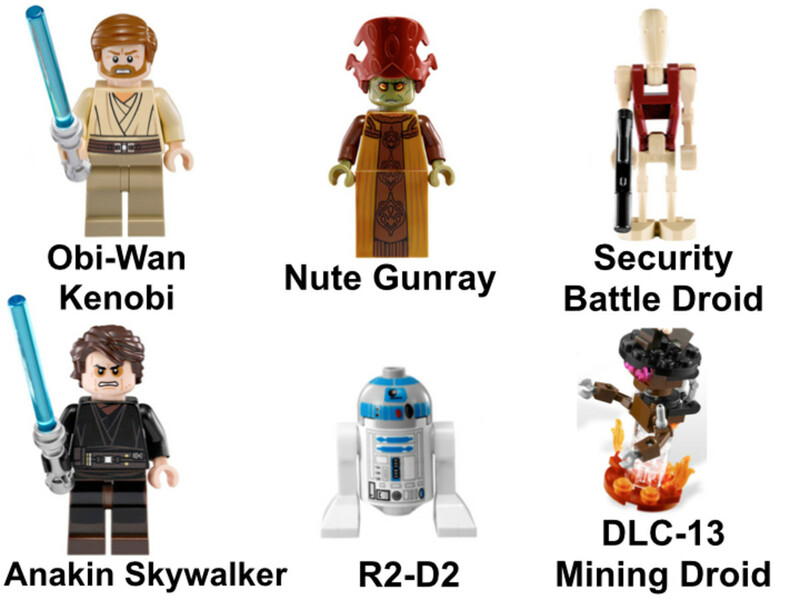 Discover the Lego Star Wars Universe. Learn about the building sets, video games, and short films that were inspired by the George Lucas' movies.